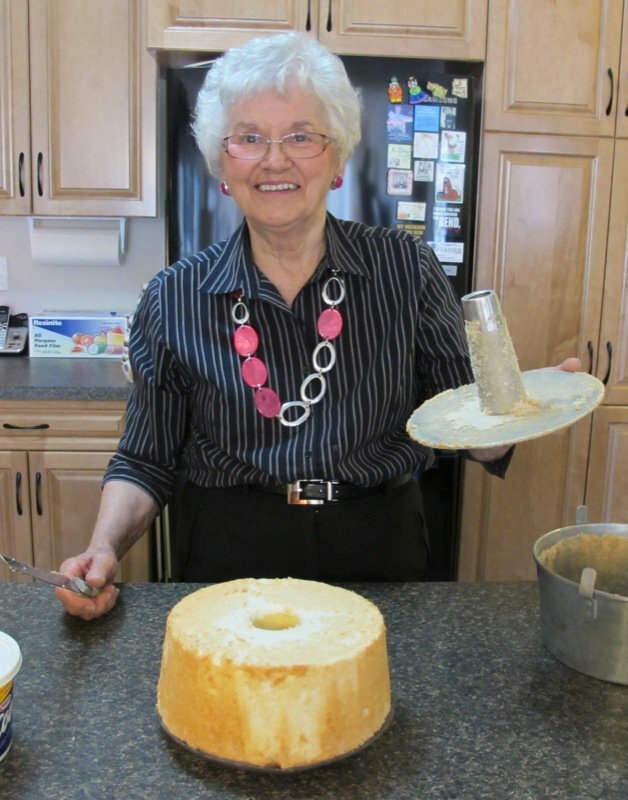 I asked mom to demonstrate how to make our family famous homemade angel food cake so I could make it for her 80th birthday. No one else could make an angel food like my mom in our neighbourhood when I was a child. Maybe no one wanted to. But, everyone loved to eat it. 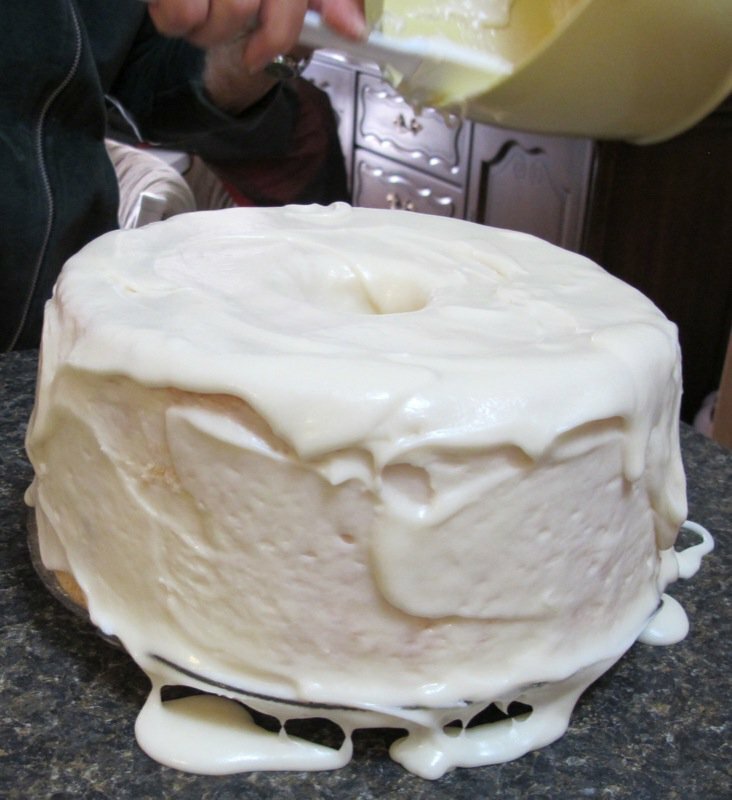 My mother worked to learn to make this moist light cloud of heavenly cake. She is a very determined woman. She failed. It fell. I recall laughing so hard because I had never seen my mother laugh so hard. She suddenly ran down the back alley, my sister and I in tow, wearing her frilly yellow checkered apron holding an angel food cake pan between her fluffy pink checkered oven mitts. She was taking the cake to show Auntie Blanche. Auntie Blanche must have known as she met us halfway with her two daughters trailing behind her. She looked at the cake, and both women howled until tears ran down their faces. 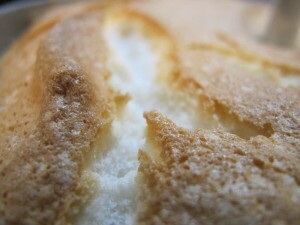 Then we all started taking handfuls of the still delectable and still somewhat fluffy, fallen angel cake. We were all too young to really understand the laughter. We were just happy that everyone was so happy and that after mom’s hard work that morning in the kitchen, she was not crying. Guess what she was doing that afternoon? Yup. She never failed again, but she improved until perfection was achieved, many years ago. 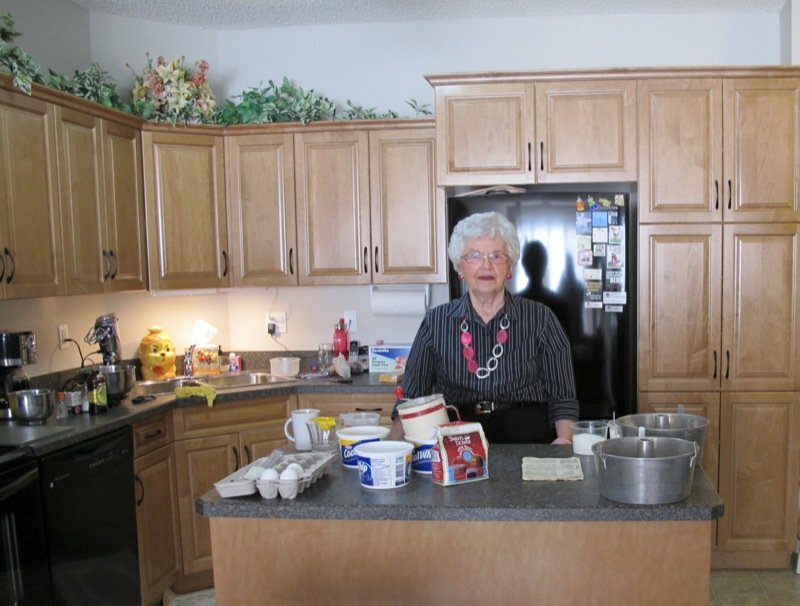 In the end, she did demonstrate how to make her homemade angel food cake for me, and I still have video clips to put together, but she actually made it herself for her 80th Birthday Party Tea! Isn’t that incredible? 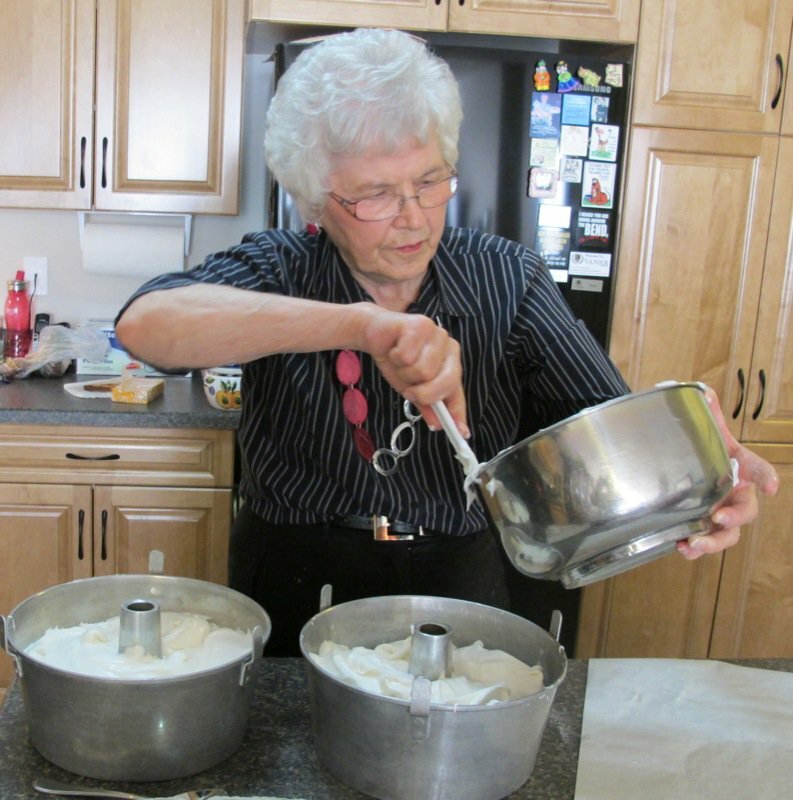 At 80, she made her own birthday cake! Mind you, I did make another “official” birthday cake for her party, but in our family, we all knew that this was the “real” birthday cake! This has been a big year for my parents. mom and dad both turned 80 this past year and moved from their home of 32 years to this gorgeous adult condominium. And, this November 6th, 2010, they will celebrate their 60th wedding anniversary. Lots of changes and rites of passage this year for the two of them. 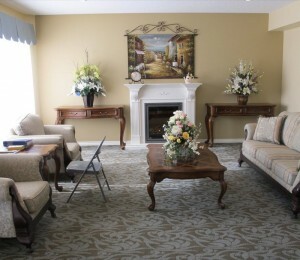 I pass the lovely waiting room in the main area and hear her door open around the corner. Yes. There she is, waving me in! Abounding energy and enthusiasm. That is my mom. 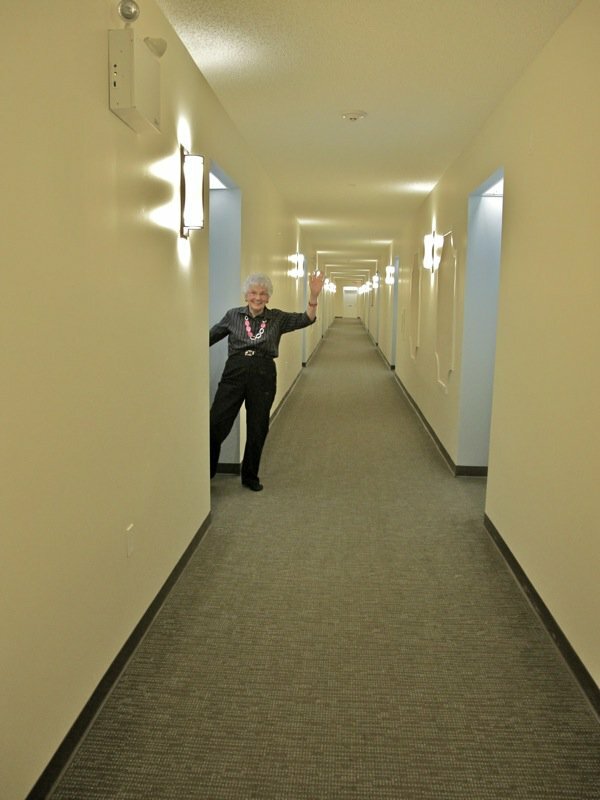 If they had a condominium council in her building, she would be the Social Convener. Well, come to think of it, she is already arranging card games and is most definitely one of the many friendly owners that warmly welcome newcomers to the building. And no time for a hug for mom. I am greeted with the unconditional joy that my little baby sister, Penny, always smothers me with. She is our hairy human ball of family therapy. She brings us together when we are too tired to be brought anywhere. And today, she is doing her little dance at the door. I am an obedient guest and do what she has trained me to do. 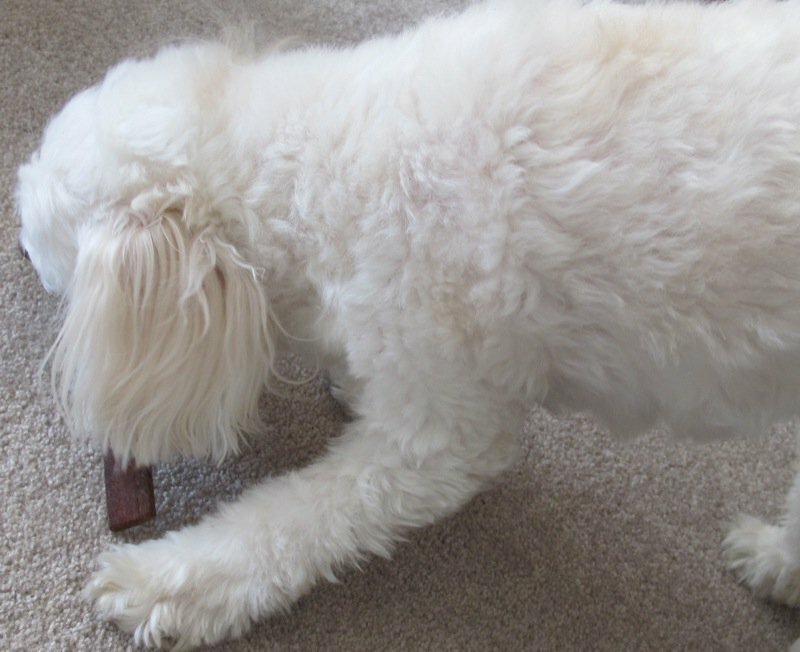 I give her a treat, and she kisses me all over before she quietly enjoys it, and then settles in her chair on her blanket. Dad is sitting in his chair by the window finishing his muffin for breakfast and laughing at the “hello ritual” we all enjoy so much. That little bundle of fluff has brought so much joy to our lives. Mom has everything ready for my homemade angel food cake demonstration. Completely ready. There is no one more organized than Helen. Except, maybe George (my dad). I turn around, and mom is raring to start. She has her eggs separated: twelve for each cake at room temperature. 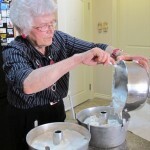 And her flour sifted three times for the first cake and two times for the second cake. 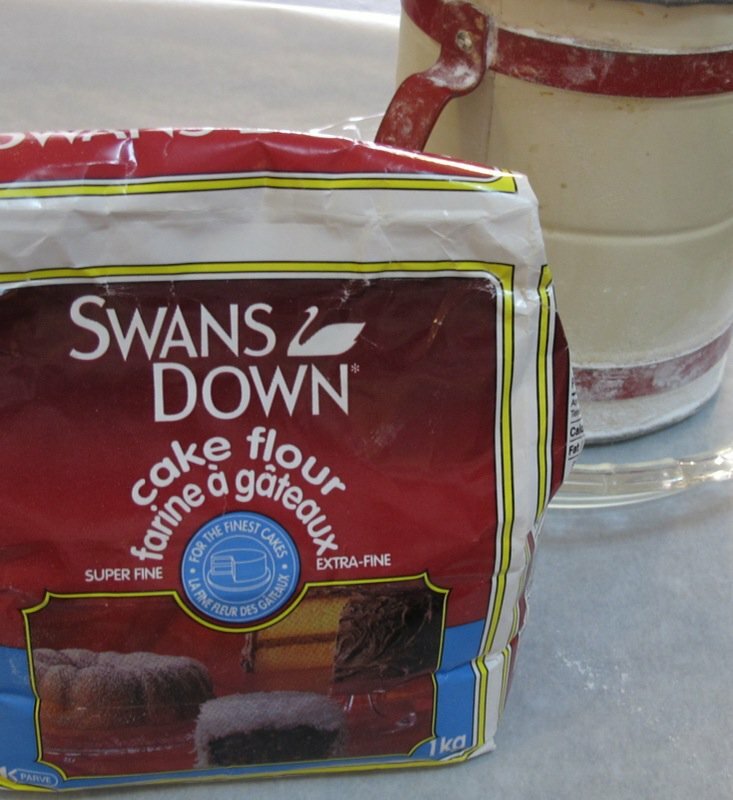 Swan’s Down Cake Flour has always been key. 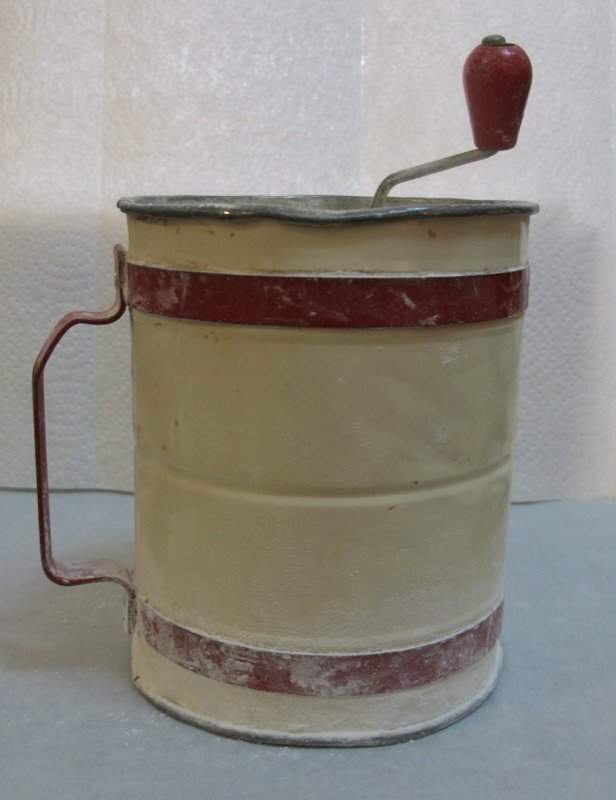 And I was charmed by this old family sifter. The beauty in this old rickety tin is found in the shadows of my memory where years flashback to my nose barely touching the counter and I see it at eye level. Even then, it was very old. 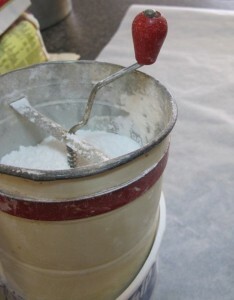 It was fun to try to turn the handle and watch the flour fall like soft snow into a bowl. I remember that. 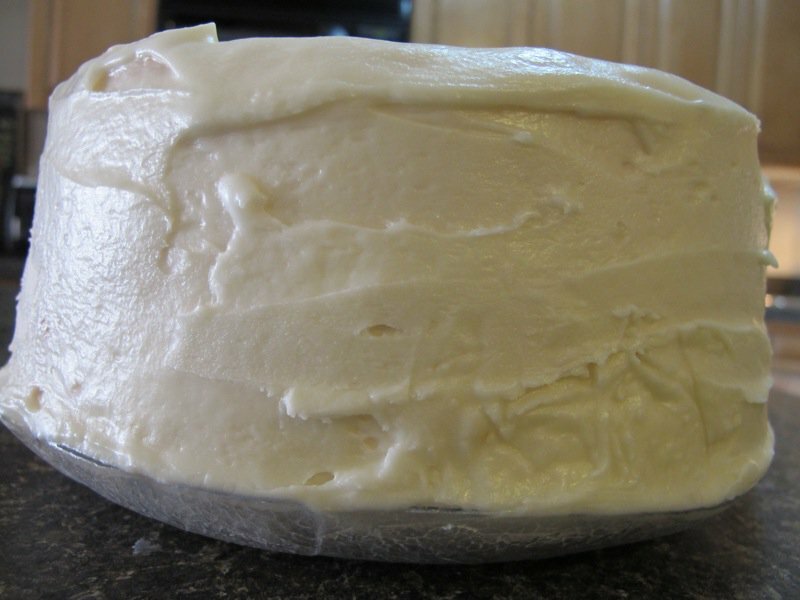 It is sitting in a Cool Whip container as the flour for the first cake has been sifted three times, and the flour for the second cake has been sifted twice. And there was her old Sunbeam Cookbook. The one that came with the machine over 40 years ago. It is the same machine in perfect condition. Mom keeps everything immaculate. Dad keeps everything working. Mom has always said it was the Sunbeam that makes her homemade angel food cake so perfect. “All anyone needs is a Sunbeam, and they can make an angel food cake.” I don’t believe this, but it certainly does help. 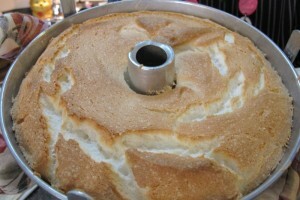 She and dad even gave me one that I had for a couple of years and it made beautiful angel food cakes. I obviously have not her touch as mine is long gone. Long, long gone. 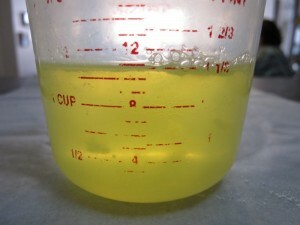 The sugar was measured. For both cakes. And this is how mom separates her eggs (below). Did I mention my mother was the Queen of Tupperware back in the day of the Tupperware Party? Everyone loved to invite my mom as she always needed the latest in Tupperware. She was a sure bet for a big bill. And, she still has every piece she ever bought in perfect condition. I wonder how much money vintage Tupperware goes for? The Sunbeam. The infamous Sunbeam. 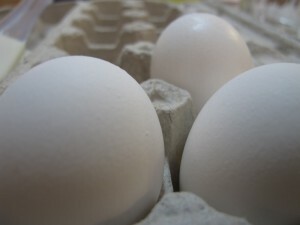 Egg whites waiting. Machine rearing, ready for take-off. Mom’s coffee pot full and empty by the time we finish. 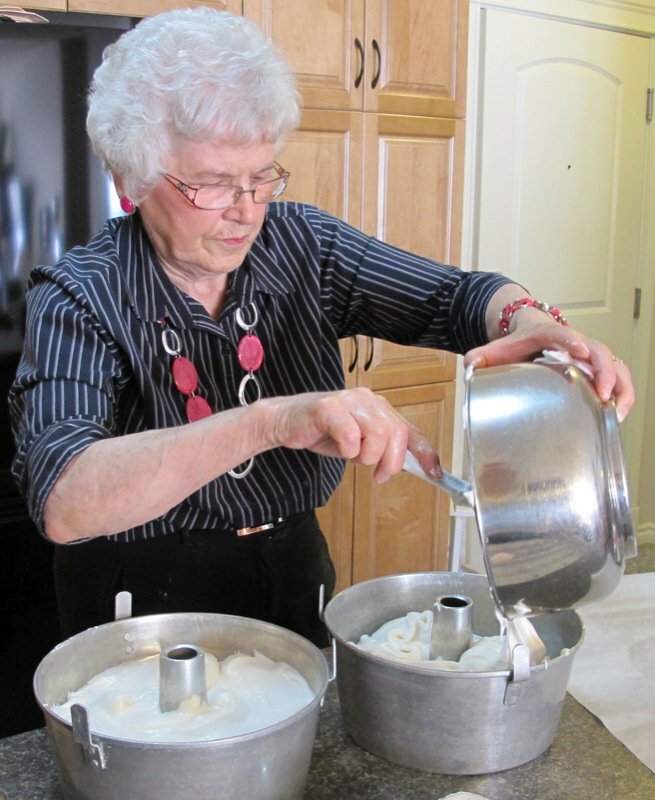 Mom has always said that it is so much work to make just one homemade angel food cake that she always makes at least two, and sometimes three or four, at a time. Today, we are making two. Well, she is. Eggs are frothed and in goes the sugar. This could very easily be a Sunbeam commercial. 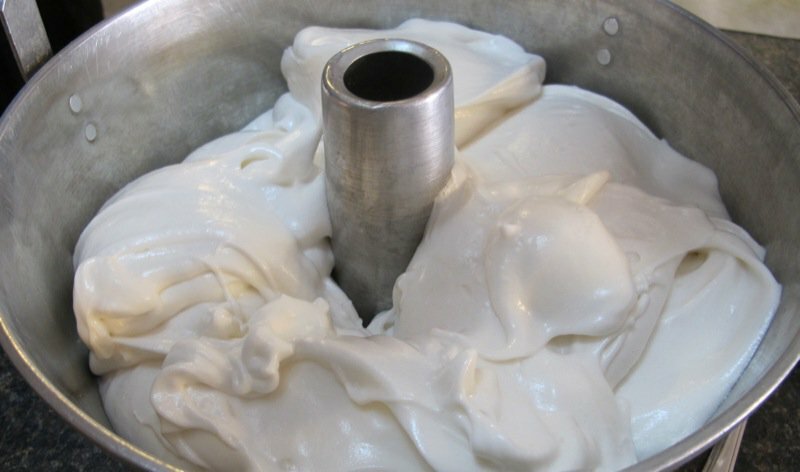 Look at the beauty of this over 40-year-old machine in how it evenly whips those whites! Lush. 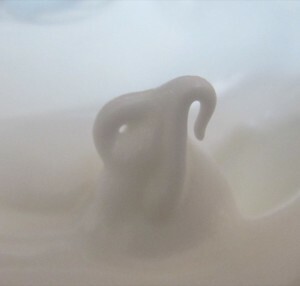 Can you see the air being whipped into the whites? Look at how they are growing up the sides of the bowl. Mom is checking to see how stiff the whites are. 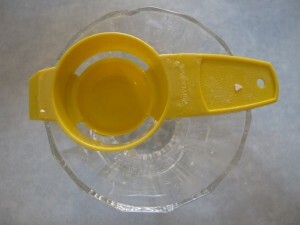 One of the advantages of this masterful Sunbeam is that the blades stay on the far side of the bowl, not in the middle, and mom is able to fold the flour into the whites on the open side of the bowl without much danger of engaging the beaters. Not quite ready. Now the whites are ready to fold in the flour. The peak below is holding its shape. I am not certain which of the two homemade angel food cakes this little grin happened in, but it appears that I may have asked a rather silly question. Mom always overestimates my ability! 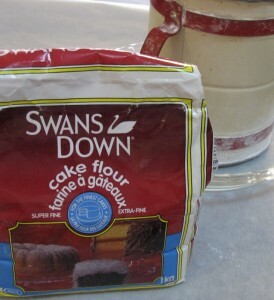 Time for the triple sifted Swan’s Down cake flour. Mom folds it by hand as she sprinkles it into the bowl. She has the beater on very low and the Sunbeam affords her the opportunity to fold the flour in on the one side of the bowl across from the beaters ever so slowly and methodically and evenly as the bowl turns. 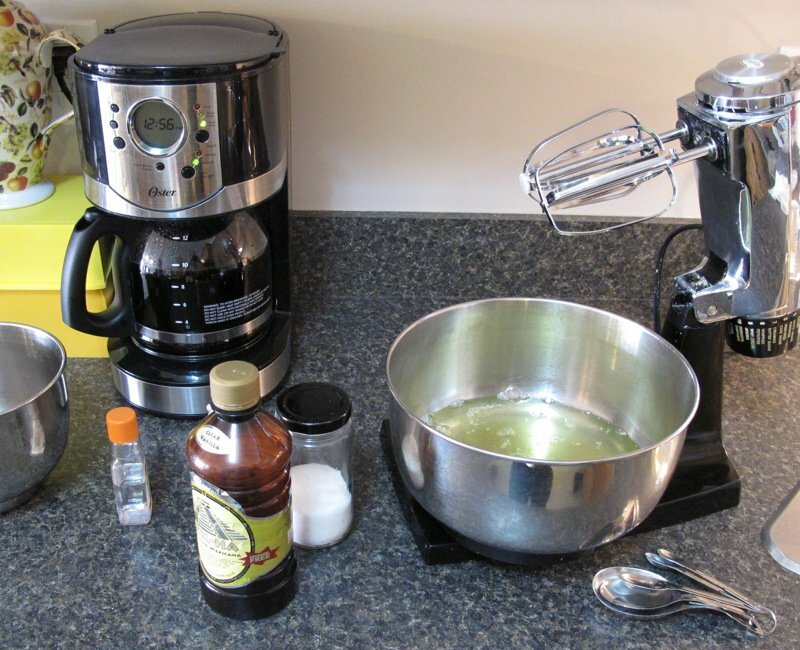 My Kitchen Aid on speed one is many times faster than the Sunbeam on speed one. She slowly and consistently folds in the flour. 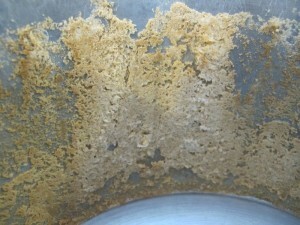 Then, ever so gently, lifts the beaters out of the bowl, still turned on low to expel the remaining whites, and is done. Into the ungreased and aged angel food pan, it goes. And then, together, into the oven. Phew! Time for a nap! I am out running for groceries, and mom is busy with something, for sure. My little baby sister can sleep for both of us. I am back in the nick of time. The cake is coming out of the oven. Look at that gorgeous crust in mom’s mitted hands! 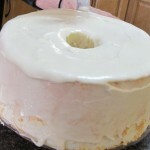 And here is the other homemade angel food cake. 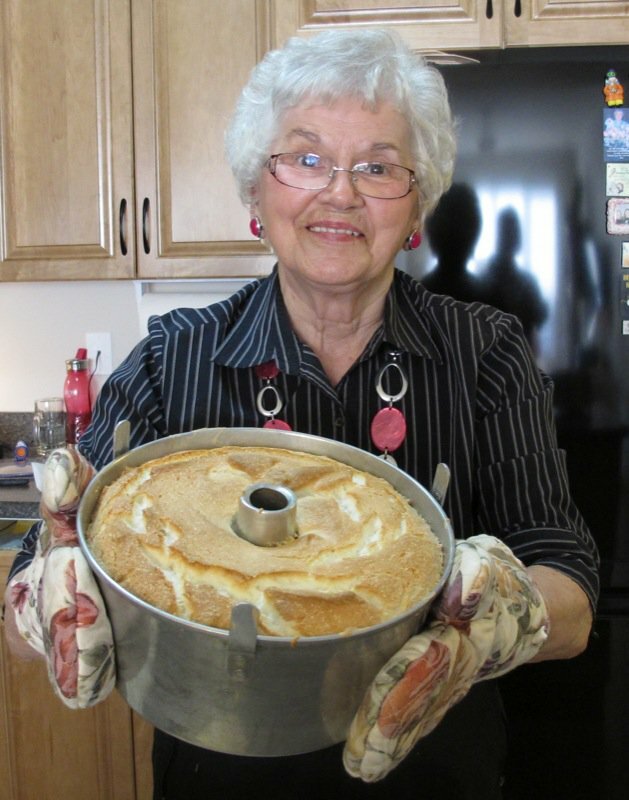 Homemade Angel Food Cake: My Mom, Helen McKinney (aka Her Royal Majesty) Presents her Cake! I love this part of the cake. The bottom is my favourite part. It has to be immediately inverted until cool, so we had a bit of time for a visit. 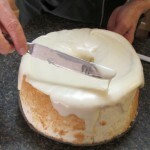 A long serrated knife is key for releasing the cake from the sides of the pan. In the left photo below, mom is releasing the cake from the pan by sawing in an up and down motion pushing toward the outside of the pan to avoid cutting into the cake. 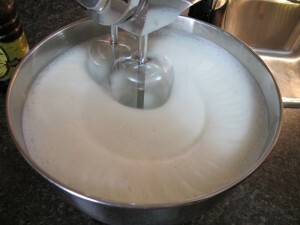 Once that is done, she does the same thing to the bottom of the cake, after loosening the middle. She then places a plate on top of the cake that is exactly the same circumference as the cake (which makes it very easy for icing, later), and turns the cake over on it. Voilà! 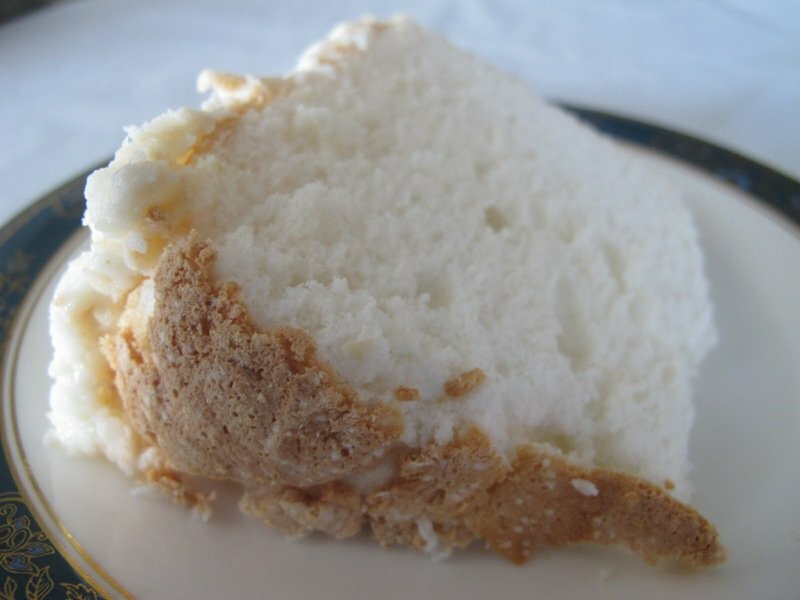 The homemade angel food cake falls onto the plate. She is a pro. Both cakes are absolutely perfect. Incidentally, neither of these were used for her birthday two weeks later. She baked two fresh ones the day before so she could serve all of her guests a fresh cake. But, it was frozen for one night to enable frosting. The cake must be frozen to frost. As they ice better frozen and taste better the day after they are made, I returned the following week to learn how she ices the cake. 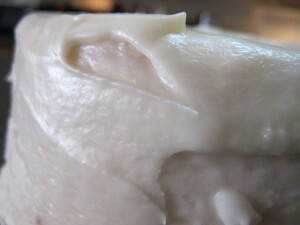 The recipe and instructions for this icing follow, but it is important to note that this is the consistency she looks for. 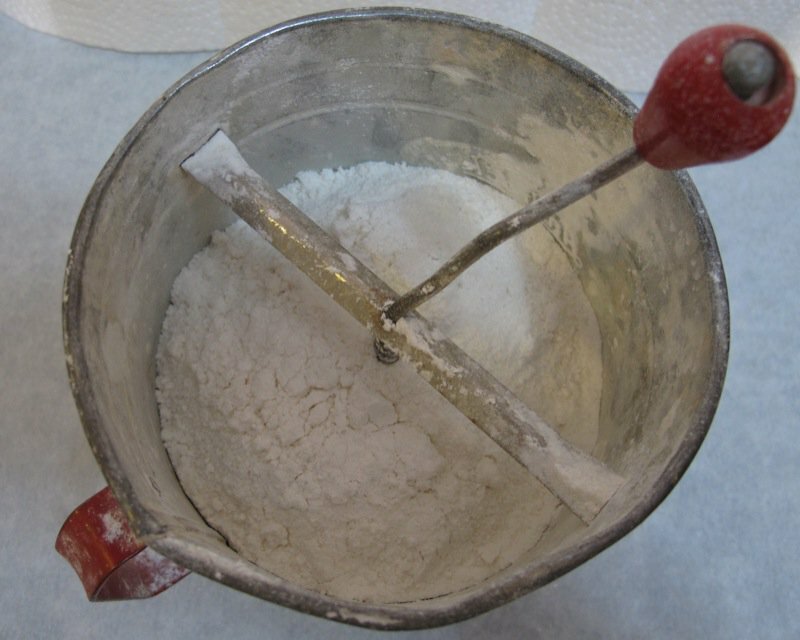 Basically, mom says: “Dump half a bag of icing sugar in a bowl (about 3 cups), add a good clump of room temperature butter (about 3/4 cup). some flavourings (1 teaspoon each of vanilla and almond extract) and just enough boiling water to make it spreadable after beating like hell by hand! LOL LOL!” Yes, she is a cyber-mama, too! Then, as you can see, she ladles the icing over the top of the cake and works is around the sides. Mom doesn’t even attempt to get the icing smooth or even. She works to have the lines go around and has it look elegant and beautifully homemade. My girlfriends all love it when I bring this cake to our birthday celebrations; the icing is coveted as much as the cake. When my grandmother, Maude (whom I often write about), turned 80, mom threw her an 80th party that the entire community will never forget. My mother hails from the central Alberta area: Clive and Lacombe, specifically, as did her mother. When one turns 80 in those small towns, it goes in the paper and everyone comes. Everyone did. 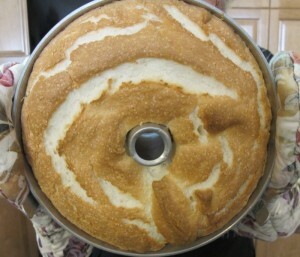 My mother baked 20 angel food cakes for that very special day. All iced with pastel pink almond icing and each was perfect. She made a multitude of ribbon and rolled sandwiches. I clearly recall her towers of Tupperware filled past capacity and the beautiful celebration of my grandmother’s life that day. I believe there was not even a slice of that homemade angel food cake left. Now, here I am, countless years later, preparing to honour my own mother for her 80th in a way that might come somewhat close to the masterful event that she threw for hers. My mother told me the most amazing story after we made this cake and sat down to talk about it. 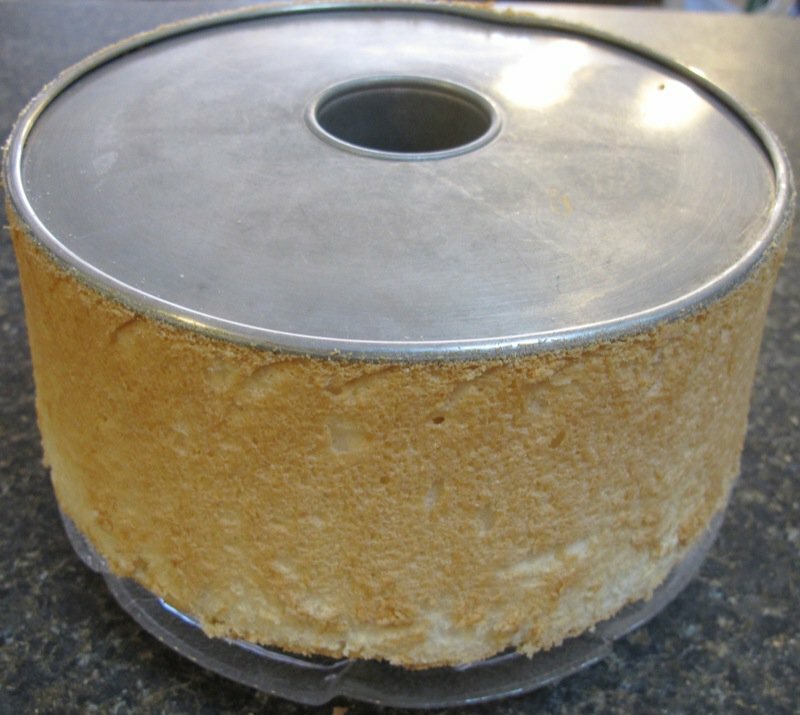 I asked how this cake came to be such an important part of all of our lives; mom shared her first memory of angel food cake. She was a little ten-year-old girl playing around her grandmother’s farmhouse when she recalled the old farmhouse was aflutter with activity. All of the women in the family were plumping the pillows, dusting the rooms, and beating the rugs to get ready for something. 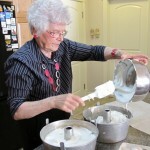 Then all worked in the kitchen whipping up fluffy egg whites after gathering the eggs from the hen house. Someone carefully cleaned the largest dishpan. 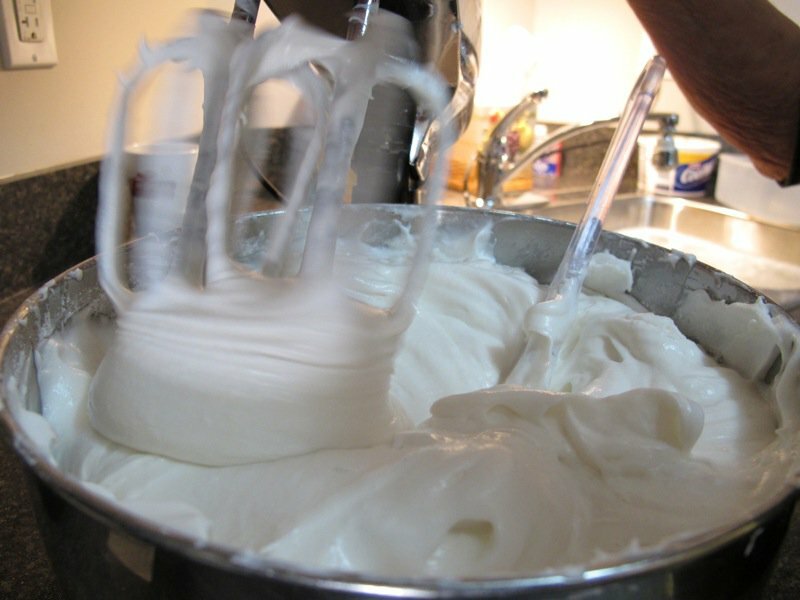 She recalled a massive round and flat whisk that was bigger than she has ever seen since (about the size of a small frisbee) that each took turns whipping the egg whites into a white fluffy cloud with. A sparkling one-quart canning jar was placed in the middle of the dishpan and the airy batter gently swirled around it and baked in the wood-burning oven. It had to be watched very closely, and turned, as the fire was built on one side, and that side always cooked faster than the side away from the fire. And her is a close up of that very cake. 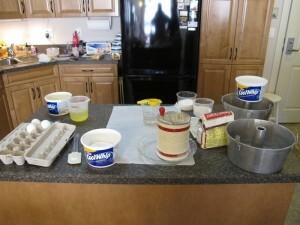 That was the beginning of our family cake…. 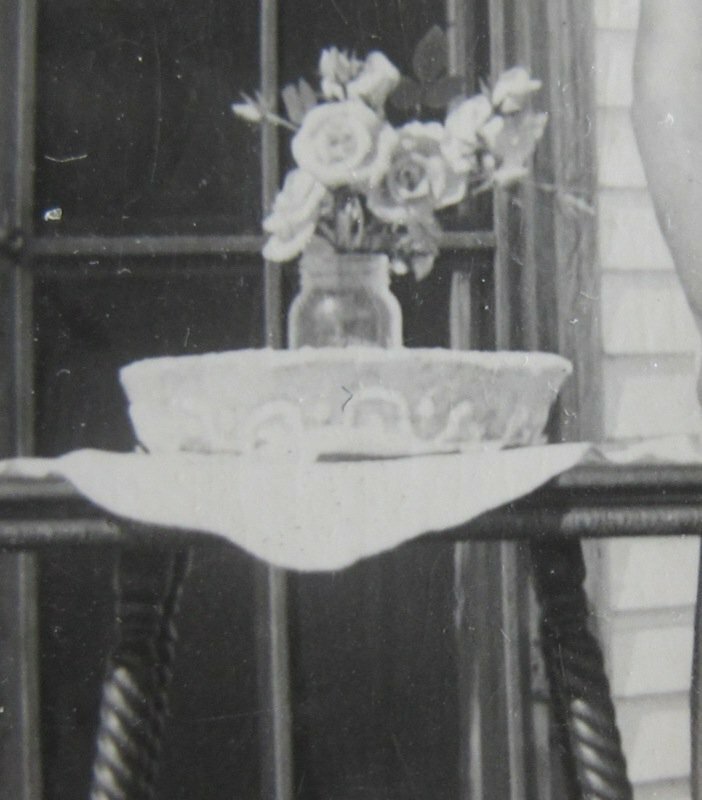 way back then, in a dishpan, with flowers in the quart jar. The celebratory cake for her grandmother and grandfather’s 50th wedding anniversary. I was mesmerized by this story. Wouldn’t it be wonderful if she had a photograph of it? Her eyes lit up. She rose from the couch and came back very shortly after with the first photograph above. What an amazing heritage. Our present-day family celebrations are founded upon such a history. 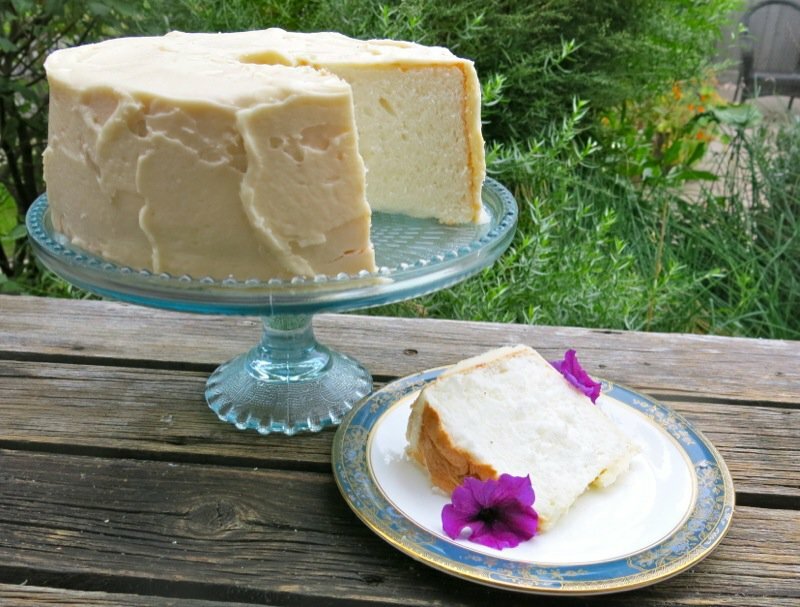 The first remembered angel food cake in the family was that of my maternal great grandmother, Etta Iris (Kling) Morrical (Born June 21, 1874) and her husband, Alberta Lincoln Morrical (born September 18, 1862, married for 50 years in 1940. My mother ten years old. 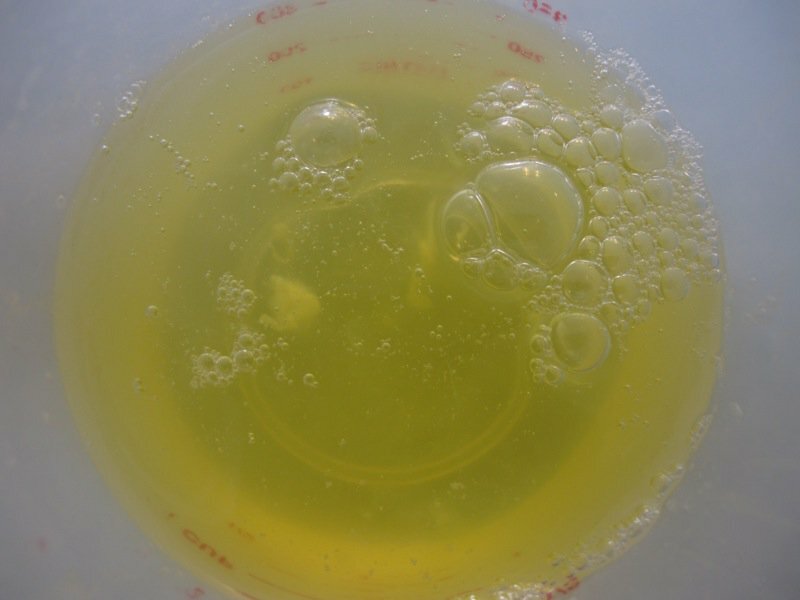 Made in a dishpan around a quart jar. And now, it is still the same beautiful cake, so many years later, shared by the descendants of this proud farm family. Yes, my sister and I threw her a lovely tea for her 80th and laboured lovingly over a myriad of delicacies where we worked our love and admiration for her into each bite. But, nothing compares to my mother’s angel food and who do you know at 80 years old that can bake as well as my miraculous mother? (If you think your mother can then let’s have a bake-off! I bet my mother’s cake’ll be better ‘n yours!) I thought this would be another outstanding example set for her grandchildren: a legacy of her never-ending hard work. In the first black and white photo above, my great-grandmother is standing beside the cake. I remember her wide and loving smile as she would wrap her wrinkled and flappy arms around me. Her bosom was ample and tired and soft, and a wonderful place to be. 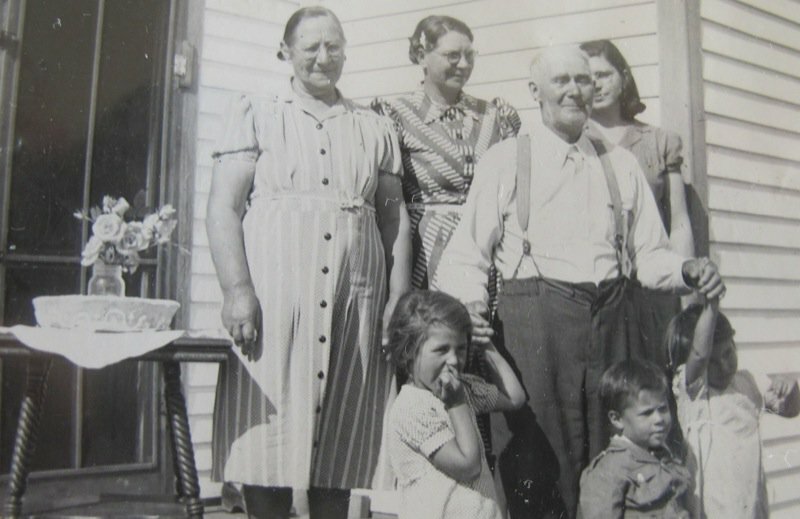 She had given birth to 13 children through her long life and had her two eldest beside her with her husband and some of her grandchildren in this photograph. My grandmother, Maude, was somewhere in the middle of this clan, born in 1898. My great grandfather had died before my birth. My mother remembers this cake. 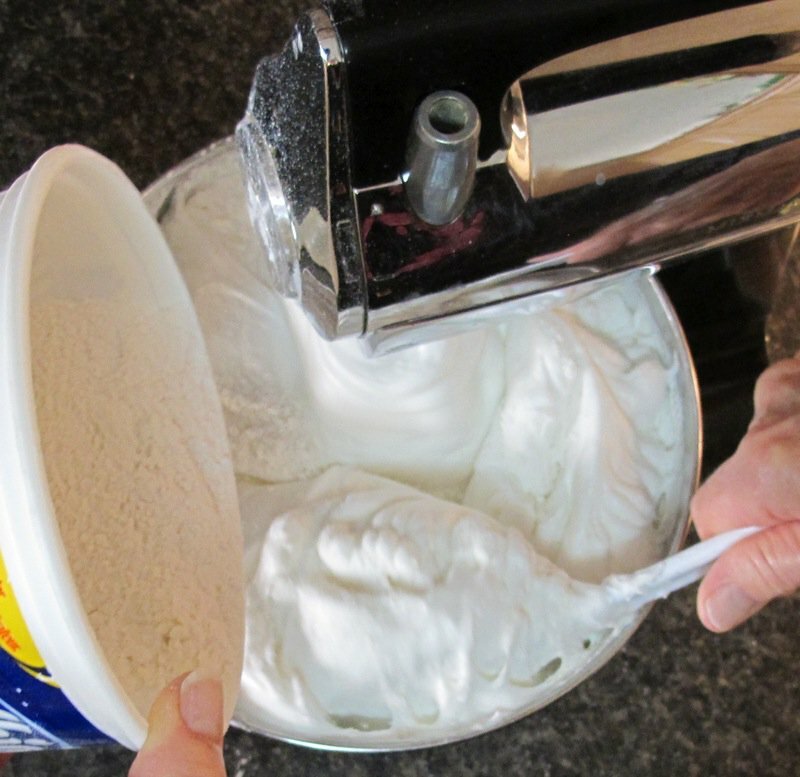 It was made in a dishpan for their 50th wedding anniversary with a huge flat metal whisk. That is a dear family history and a wonderful foundation from which to build the tradition of this family cake. Below is Etta Mae Morrical, my great-grandmother. She must be in her 90’s in this photograph. (My mother recently got into scrapbooking.) Now, this isn’t the first family angel food cake, but it is the first mom can remember. The roses were cut from the bushes lining the house. I have always grown bushes against my house… and we have often placed flowers in our angel food. When my daughter, Ragan. turned 18, her angel food had a spray of roses growing up one side and through the centre of the cake. Thinking to put flowers in this cake is not so novel. But it is a wonderful tribute to our past in this family, now that I know this story. 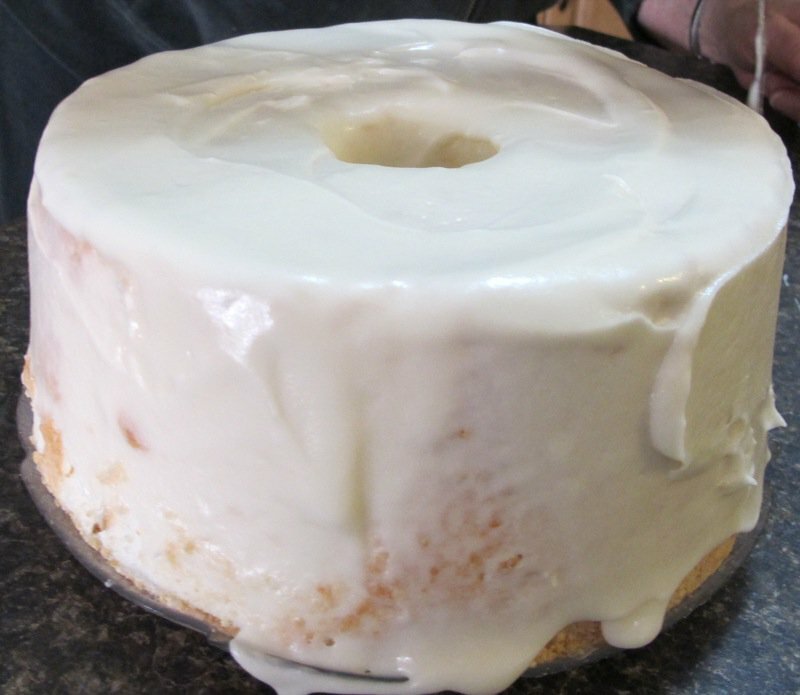 A legacy from my great grandmother through my mother and eventually through me is this famous family angel food cake. Penny is awake and clearly not very frisky, but must have sensed my awe at this revelation. A Traditional Family Special Occasion Cake 6 generations strong; still beloved by each and every one of us. Mom never makes just one cake. She always makes 2 at a time, and almost as often, 4. The ingredients are prepared, lined up on her counter and she moves through each cake like a pro. 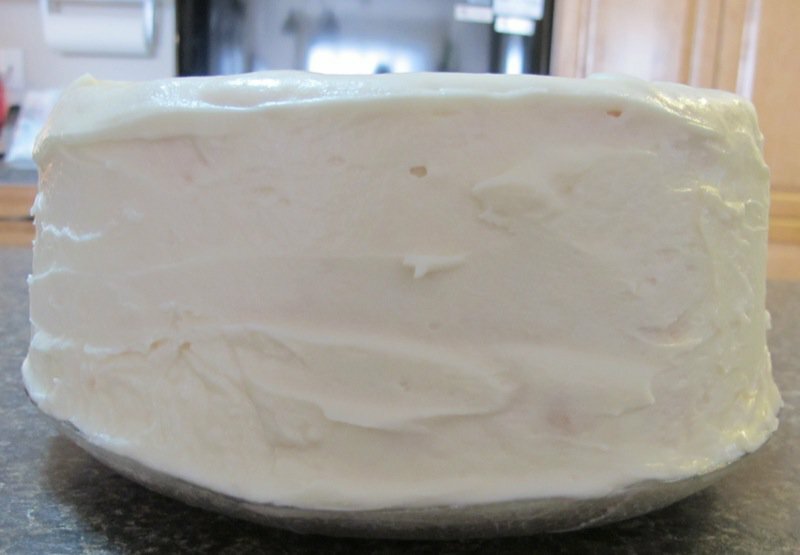 There is always a frozen angel food cake waiting for icing in her freezer. I cannot imagine not being able to count on mom, in emergencies, to ask her to ice one for me. She has never said no. She is famous within my circle of friends and this city for her cakes. Each and everyone is perfect. Hello Valerie. Thank you for your visit to my blog. I would be most happy to talk to you about retirement but maybe we should have that conversation via email instead. You can reach me at northcoastcook AT gmail DOT com. I look forward to talking with you. This post is a lovely tribute to your mother and, indeed, a family of women. I thoroughly enjoyed reading it. 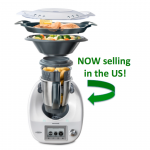 I happen to have that same Tupperware egg seperator! And I’m the proud owner of my ex mother-in-law’s very old Sunbeam mixer – still working! What an wonderful story: baking the cake in a wood burning stove in a dish pan with a glass jar in the centre! It is amazing how history and culture is linked to food. My parents made the same changesd late last year moving from their home to a condo. It gives them the freedom they always craved. Thanks for sharing your moms recipe. I love your PENNY! She is so cuuuuuuuuuuuuuuuuuuuuuuuuuuuuute! A glass jar in the center :-)) What an amazing idea! 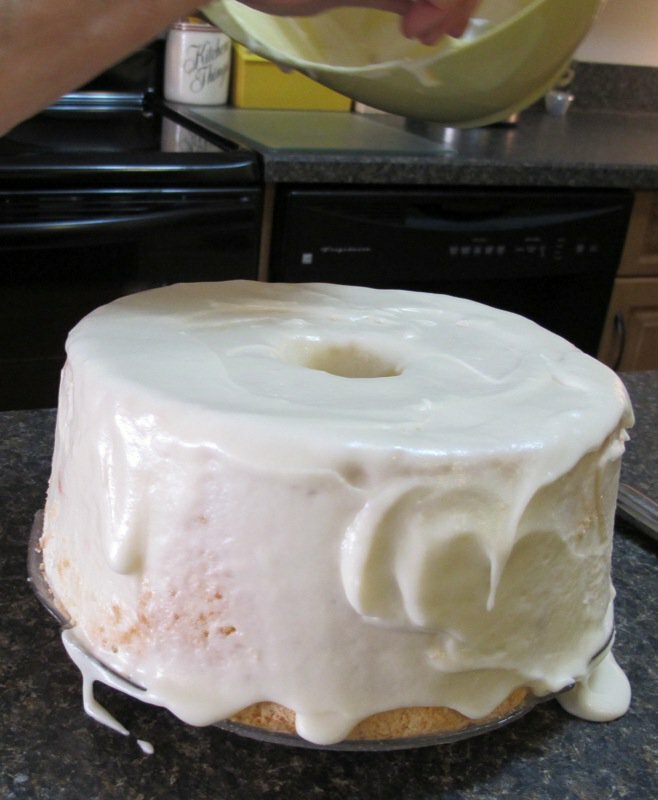 I am a huge fan of chiffon and Angel Food cakes…thanks Helen, for sharing the family recipe! Your mom has the loveliest most adorable smile I’ve seen on an 80 yr old woman. That smile is one that can definitely brighten up a room! I luv it 😀 Penny is adorable too. I’m sure if dogs could smile, she would have a smile as beautiful and bright as your Mom’s. Dogs definitely know how to make one feel loved and welcomed. 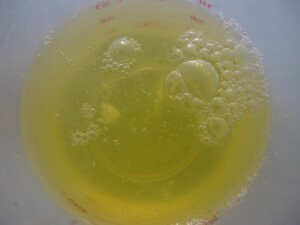 I love the look of beated egg whites. All that frothiness makes me just want eat it right then and there. I must have a thing for froth…teehee. Oh my gosh! 20 angel food cakes?! Holy moly I wonder how long that took. And my oh my how times have changed. Baking this cake in a dishpan with a glass jar in the middle in a wood burning stove, I never would have thought. Thank you for sharing this wonderful story and family tradition with us Valerie. This is exactly the type of post I love to read. I get to learn more about the author, and I get a great recipe too. Thank you to your Mom Helen for taking the time to share this recipe with us as well 😀 Until next time my friend. OH MY GOSH——it literally took me 50 minutes to read it all – I’m just overwhelmed –PLEASE no more how wonderful your mom is BECAUSE SHE IS N O T !. seriously she is NOT. She is just one proud mother 🙂 🙂 :). Often I give mom whites when making homemade ice cream or lemon curd – or, she makes homemade ice cream, or lemon curd – but too often discards her yolks. I purchased a carton of whites the other day to use on a batch of meringues, and no matter how I tried, they would not work. 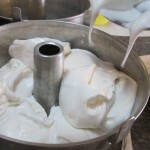 I used 4 fresh white, and in a second, I had my meringues. 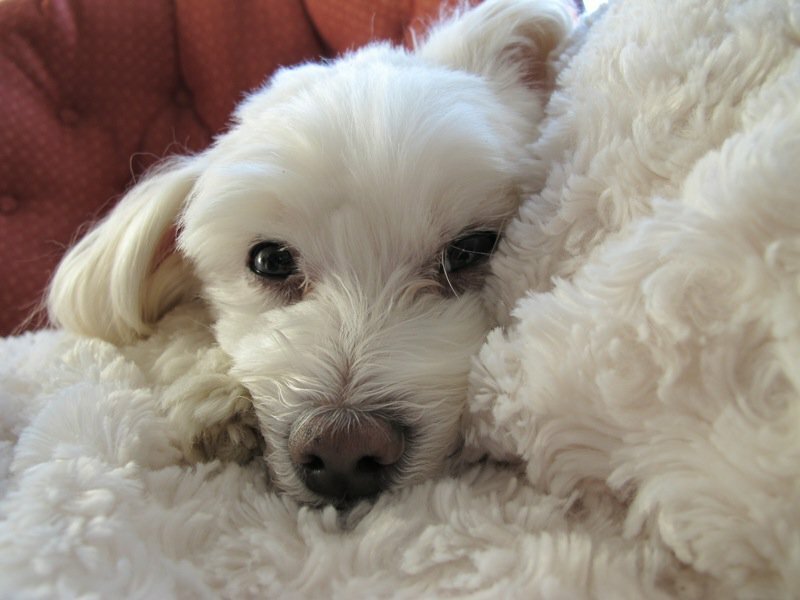 I have suggested mom use the cartons of meringues, but she won’t hear of it… and it is all about habits and preferences. She doesn’t care for chiffon cakes, which usually take yolks. 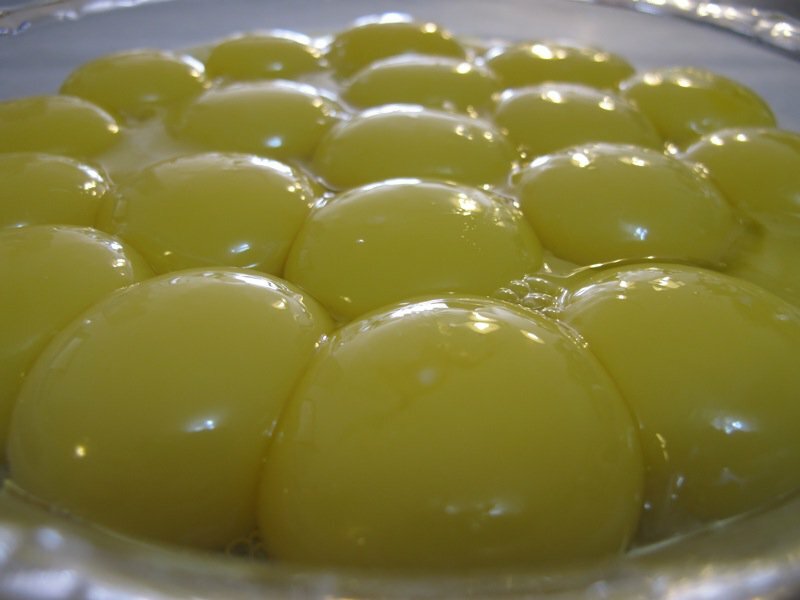 I do make some lovely eggy sauces and zabaglione with my Thermomix that just use yolks, but no one could make enough yolk recipes for the amount of angel food cakes mom makes. Suggestions are welcome. I cannot stand throwing out anything edible; nor can mom. Thankyou for the detailed recipe and all the lovely pictures! I’ll be making this gorgeous cake today! Let me know how the cake goes for you, Mikayla. We love creme brulee, too!!! I make several batches of homemade egg noodles with my yolks and freeze them for handy batches of chicken and noodles or beef and noodles throughout the year. 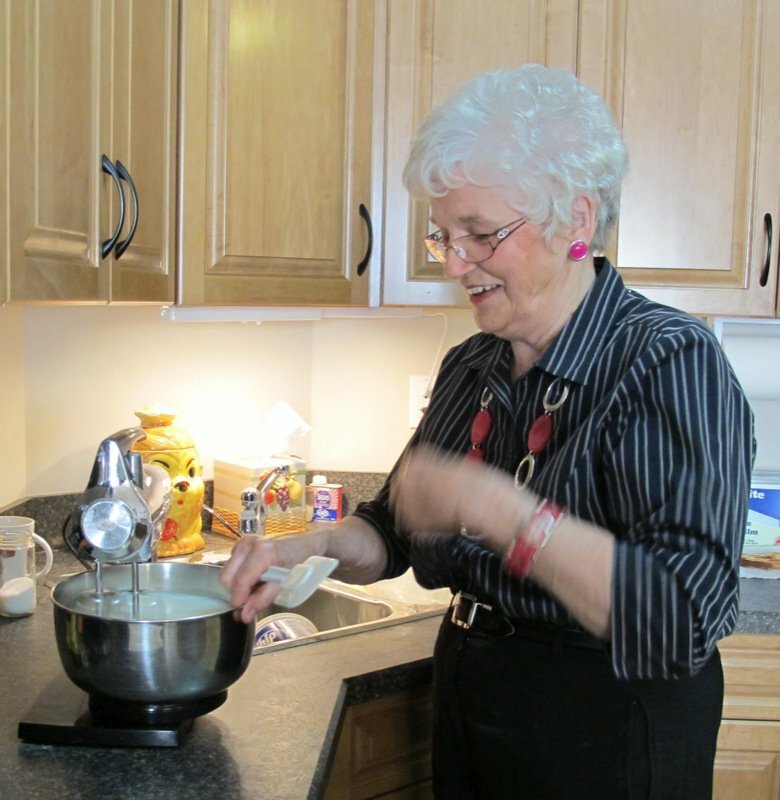 My husband’s grandma would always make noodles and angel food cake together. Mom almost always did lemon curd, but this is a great tip! Your Mom is so cute! I just want to hug her! And so is your sister! Thanks for the recipe. I haven’t made an angel food cake in eons and just love a good homemade one. 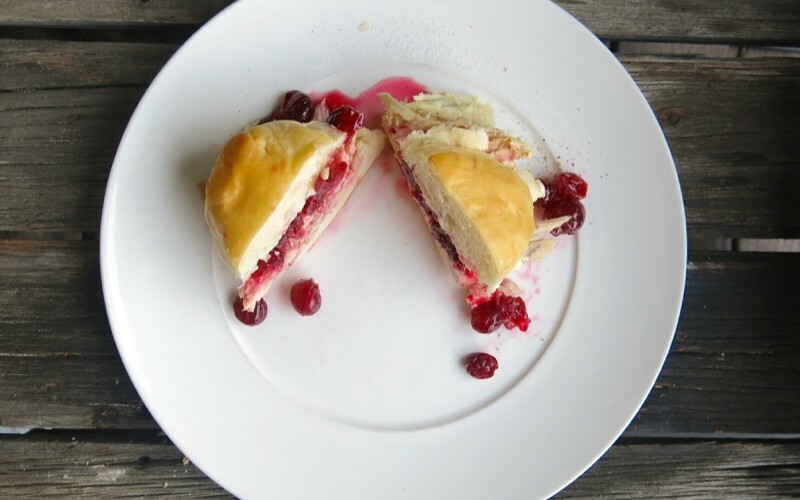 What a fabulous “howto” of making an angelcake! Angelcake is not something I have ever tasted but it looks so beautiful! Your mom is such a vital woman! She looks to be 60 rather then 80! I am so making that cake! What an awesome post! Your mom is truly an amazing woman; you are so lucky Valerie to have both parents still healthy and going strong and having each other; this is truly a blessing! Loved that story and it really speaks volume of your mom’s character and personality. Wow! You know i never tried to make angle food cake! It seemed like it was too finicky to me. This cake out of Helen’s hands is a beauty! and to think she made several, all perfect. I love it. That dog is so cute too. The condo looks so neat and tidy and cozy. Oh, Val..what a beautiful tribute to your Mom and story about how her Angel food cake came about. Love the dishpan ‘baking pan’. The best recipes are the ones that are handed down and near and dear to our hearts, and you’ve got the jackpot of that! Great baker and beautiful lady! I had no idea that you put the flowers in my cake as tradition! i think back and now I know what a special peice it was to our history! Grandma is amazing and shouold be honored, she is ALSO a proud mom, not just. Oh my! Awesome read! Loved the photos and the stories. I work in a skilled nursing facility and we regularly make angel cakes (from commercial mixes *sigh*) for our diabetic patients. Our cakes definitely do not come as good as your mom’s. Thanks for sharing, worth a try. P.S. WOW! 80 and baking! 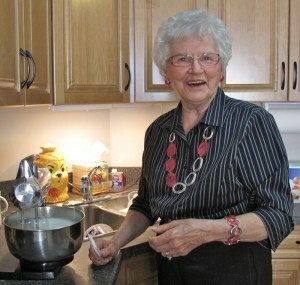 I was amazed by the beautiful work you did here in tribute to your mother and was looking for an angel food cake recipe. I baked it tonight and it was…breathtaking. There is not a crumb left it was truly magnificent. Let me know how your angel food cake goes. 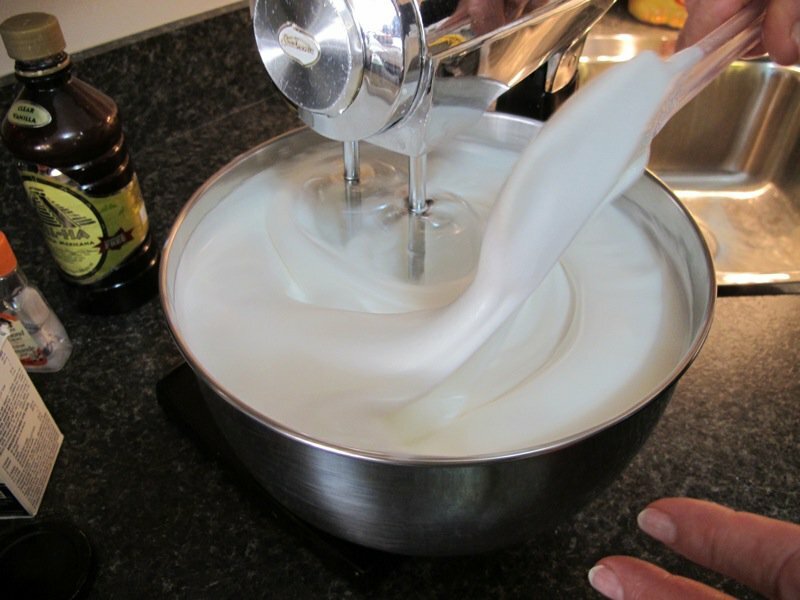 There is nothing like it, to me… absolutely no comparison to a mix… and they are even better a day or two after they are made. Mom always freezers hers overnight at least, before icing it. I am sure I said that. 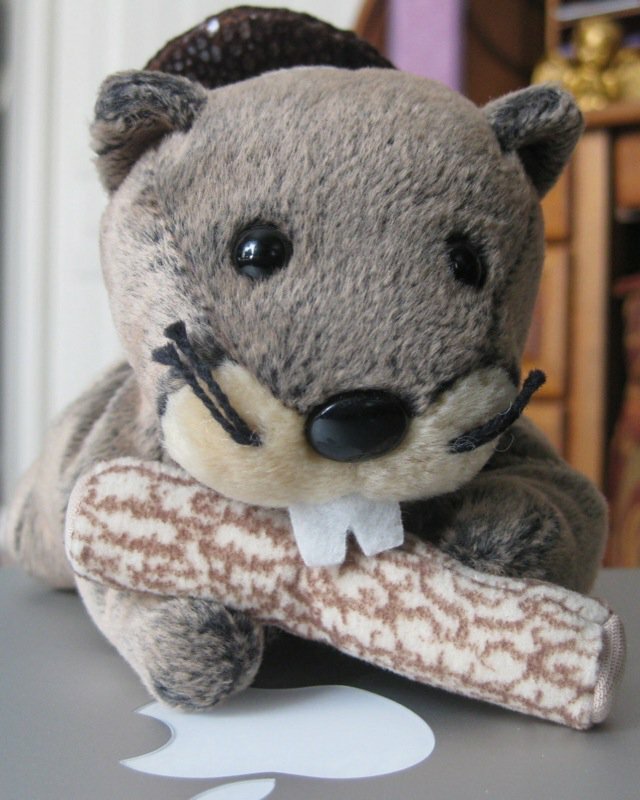 My gosh… I am so excited that you are going to make one! Lovely story. 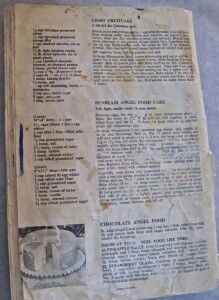 The same cookbook was used by my mother in Australia, who was also a fabulous cook. I was so insired after reading about your mum, I made this cake. This was the best cake I have ever tasted. How truly touching and personally gratifying. Mom will be deeply touched! So glad you enjoyed it, and may it become as important to your family as it is to ours. 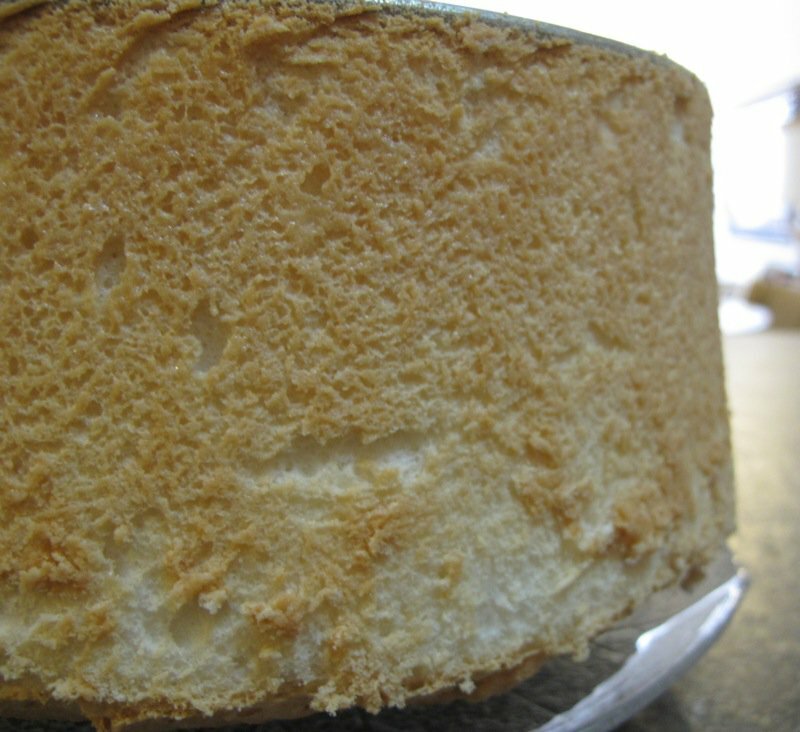 Angel food cake has always been our family’s birthday cake, too. We have always used my grandmothe’s recipe. 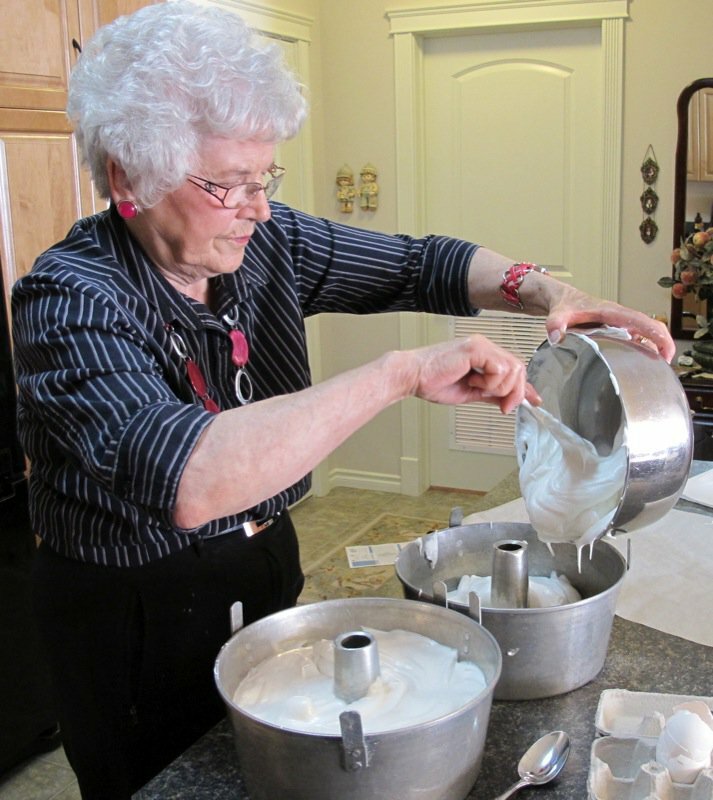 She was born in 1879 – I have no idea what the origin of her recipe was, but she certainly whipped those egg whites by hand during my Mother’s childhood. I’m sure it was baked in a wood stove for many, many years, too. 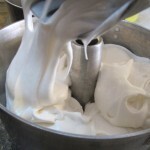 We re now baking it for the 5th generation and it is still everyone’s favorite. Her recipe is quite similar to yours. These culinary family traditions are so very special and very important for the young. Have you or your mom ever froze these cakes to have on hand? Mom always makes a minimum of two at a time and she always has a couple in her freezer. It doesn’t hurt them a bit. They freeze beautifully, but more importantly: CONGRATULATIONS! What an exciting time in your life. You will be changed forever. Boy did this bring back memories. 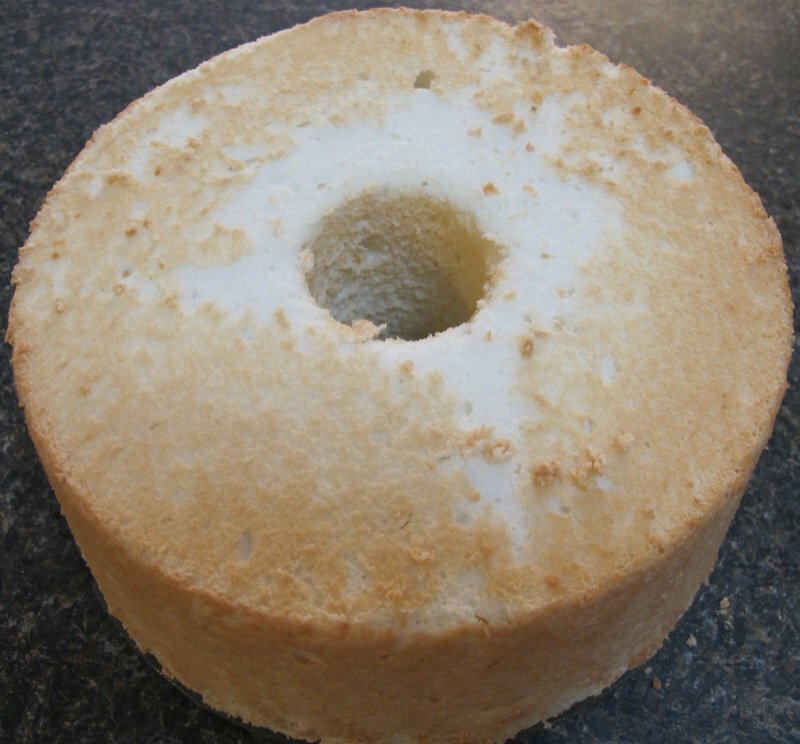 From early childhood, I remember my mother always making the traditional “birthday cake” from scratch and yes it was an “Angel Food Cake”. Looking at you mother, I too can remember my mother doing this all by hand and she did not have my kitchen aid. 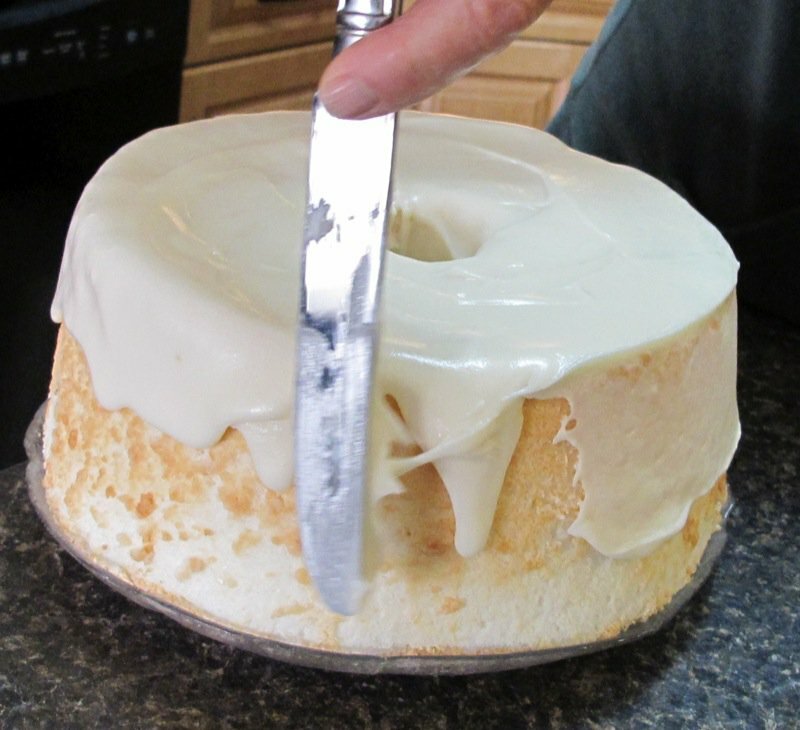 Fast forward and one time I made angel food cake, from the box, for my husband’s birthday and the kids and grand kids said it was the best birthday cake ever. One of these days I will have to try the real thing. By the way, my mothers birthday would have been tomorrow, 3/24 and she would have been 98. We lost her 8 years ago, but she left us with everything good!! Thank you for allowing me to go down memory lane! What a beautiful message. That is what blogging and posting and writing and sharing is all about. I am deeply touched by your memories of your mother and this special cake. My mother will be 82 April 21 of this year (2012) and I know there will be a day that I read this post without her. You have reminded me to cherish every precious moment we have together as family. The food that we share and the stories behind the food keep them with us, and our children, forever. What a fabulous tribute to your adorable Mom – who looks fantastic for her age! Bless you for appreciating her so, Valerie! 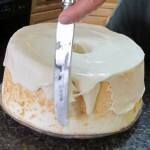 I have, until now, been far too intimidated to even try making Angel Food cake, but I will now! I am totally inspired!!! Thanks for posting the recipe and huge hugs to your Mom for inspiring me! What a lovely message, Sherene! Thank you! My mom WILL be touched, as am I! Thank you so much for sharing your beautiful memories. I read your entire page through smiling tears. Every picture could have easily been of my dear Grandma. It is startling how closely they resemble one another. My grandma Virginia always made me an angelfood cake for my birthday, every year until she was 91 years old. She passed away in 2011 at 93 and I miss her so much. I was blessed with 39 of those angelic rings of heaven tasting the love she put into it in every bite. I initially was lead to your site looking for a fitting recipe to try to continue the tradition for my grandkids, as Grandma never wrote anything down. She was a farm wife as well and her amazing skills as a cook were from years of feeding hungry farm hands and family when she wasn’t in the fields herself. So you can see what a blessing it was to find you. 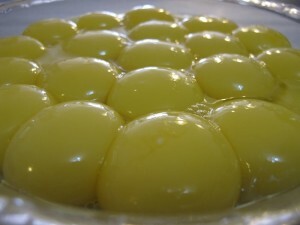 I will be trying your beloved mother’s recipe in January when the next grand’s birthday comes around. I know I will be thinking of grandma with every egg I separate and be thanking you in my heart for giving me this sweet moment of remembrance today. Best wishes and God bless you and your beautiful Mom. My mom has been in the hospital this week. She has just undergone surgery for bowel cancer at 82 and I am sure you can imagine the trauma that was to her body and soul. I read your lovely comment to her yesterday while she was having a kind of blue day – a little set back in her recovery – and she just beamed! This is why we all do what we do… to touch one another and to support one another as mothers and grandmothers through the food that brings meaning to our lives around our evening tables. I cannot wait to hear about your cake! What a special post! I know it is an older post but it was so touching to me to see your pictures and read the wonderful story and history. My great grandmother was one to entertain but more as a cook than a baker. My grandmother always had 5 things going at once whenever we visited. I think I got my love of feeding people from her. 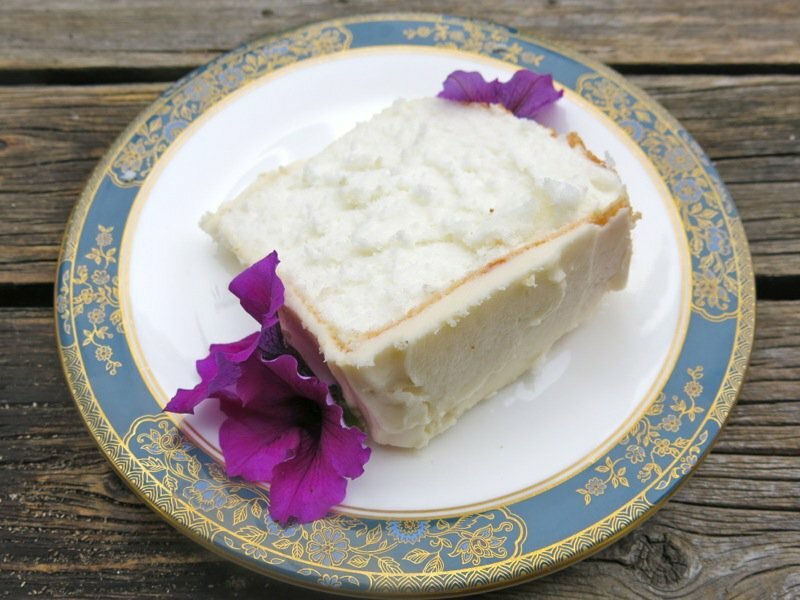 I was so thrilled that this recipe turned out so beautifully for me because the last angel cake I tried fell. This stayed gorgeously high and light. It is almost cool and I can’t wait to taste it finished. It will be hard to wait until tomorrow, it smells so wonderful. Thank you so much for sharing your special memories! This is why I post these recipes… and comments like yours are rare, but so gratifying. 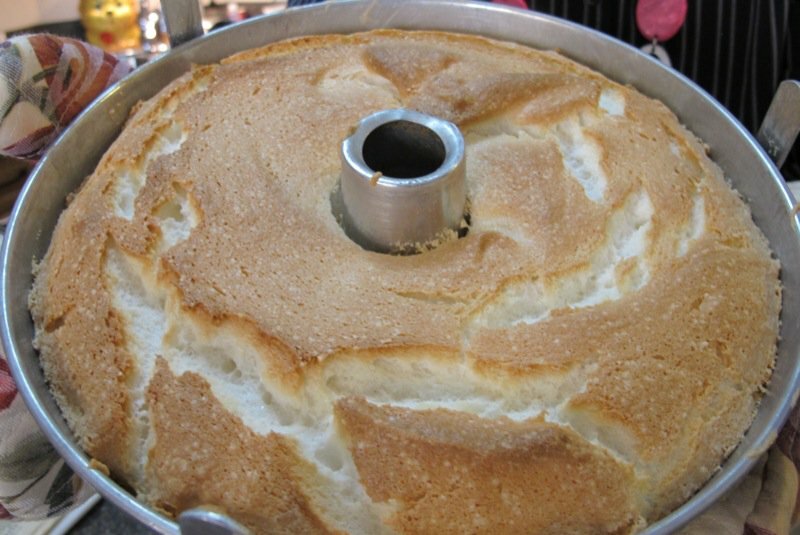 Thank you so much for letting me know that the sharing of this story and recipe created a beautiful angel food cake in your home kitchen. What a feat! Good for you, and big tight hug! In the ingredient list, it calls for 3/4cup of granulated sugar. 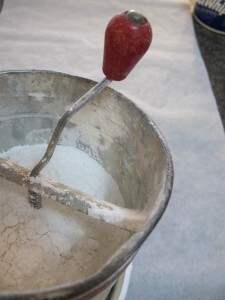 In the directions, not only do I add that sugar to the sifted flour but I add 1cup of sugar to the belated eggs. Should the ingredient list 1 3/4 sugar? If you take a look at the ingredients again, you will see they are written in the order they are used. The 3/4 cup of sugar is listed earlier, and the 1 cup of sifted sugar is listed at the end. Your beautiful story brought tears to my eyes. I don’t have anything but a pie pan from either side of my family and I cherish a memory my mother told me about that pan. You are immensely fortunate to have a rich tradition to share with your family. I wish I had more, but alas I do not. I hope you don’t mind, but I am printing your story to keep in my recipes. 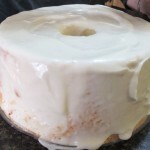 My mom loves making angel food cake-but hers is from a box and last time I was helping her I decided for her up coming birthday I would make her one from scratch and I found your blog. I’ll share pictures with you, if you like. But I think it will be divine. I need to go dry my tears, and make sure I have a big dishpan and a mason jar on my list of party prep necessities. My heart is warmed on this cold rainy autumn Friday morning in Edmonton as I read your words. Thank you for sharing your heart and mother love today. I cannot wait to see a photo of your cake – I will add it to the bottom of this post. You read my mind. I would love to hear how your daughter loves her cake. 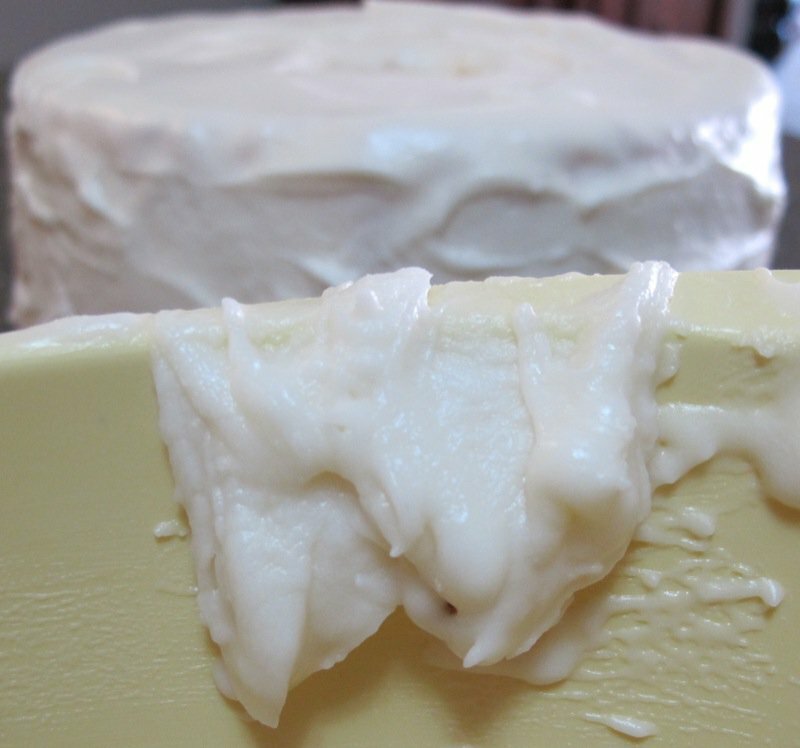 This used to be “the” cake – the one that marked a woman’s ability in her kitchen… and no one even knows how to make it anymore. The boxed cake is nothing like the made from scratch recipe. It is truly angel food and your daughter will request it ever after, me thinks! Great news, the cake was a hit! My daughter loved this cake. She isn’t normally very fond of sweets, but she ate her entire slice and asked for more while licking the icing off her fingers. My family isn’t a huge fan of almond extract so I cut the amount in half for the cake and omitted it from the glaze, and it tasted fabulous. This was such a joy to make too – not complicated and watching it rise while baking in the oven was exciting. I am printing off your recipe to keep it in my collection of favorite recipes for the future. That warms my heart, Tessa! I just found your story and pictures – priceless. Thanks for sharing them. 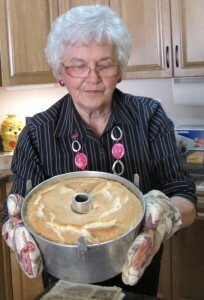 I too had a granny in central Alberta who made angel food cakes for every birthday. Wonderful memories of her, and her love of cooking and baking and hospitality. 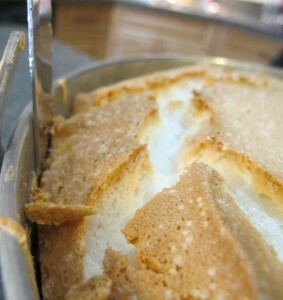 Every family birthday is still celebrated with angel food Cake, and now I’ve been inspired to bake ‘from scratch’. What a wonderful message. I wonder if I knew your granny. 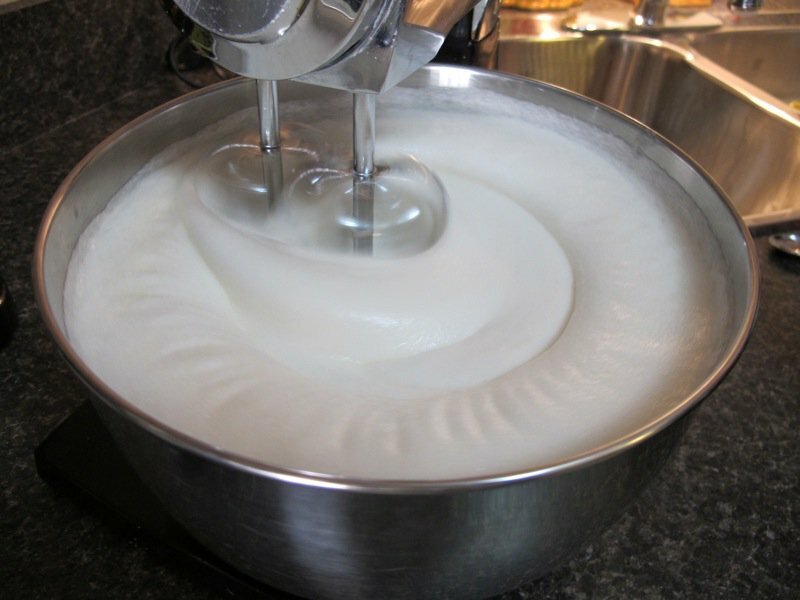 I came across this recipe and story last night while searching for an angel food cake recipe. I made two cakes today and both were so delicious. Thank you so much for sharing your family. Your mother is a lovely lady. 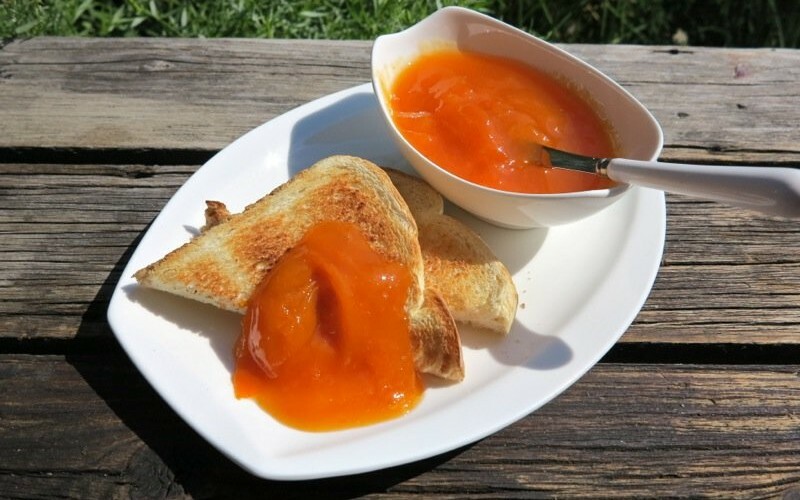 I made this for Easter with a strawberry sauce. I didn’t beat the icing long enough so it was more like a glaze. No biggie for us though, still tasted great. I forgot what it was supposed to look like until after I poured the glaze. 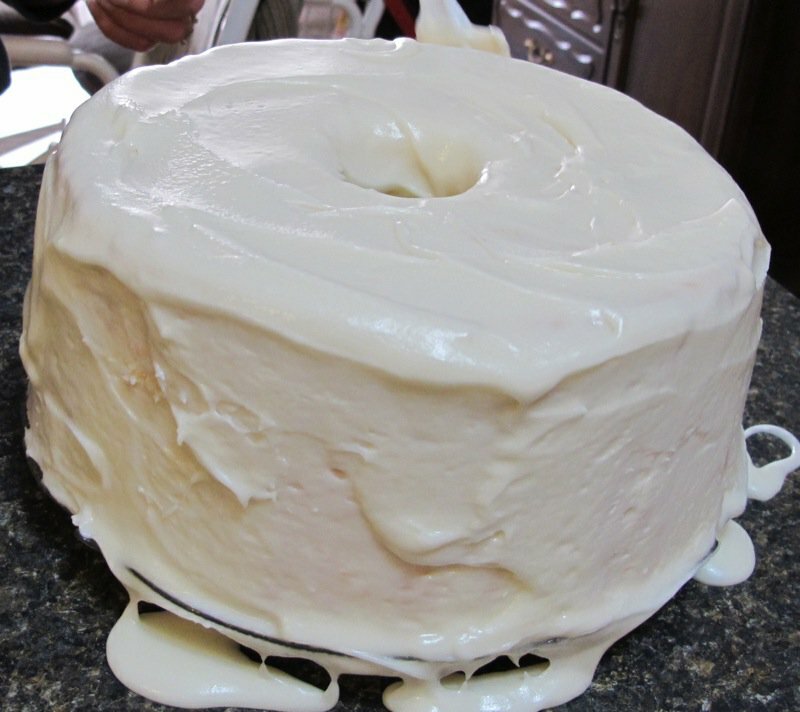 Hence it being a glaze and not an icing. 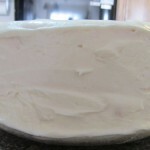 My mom told me it reminded her of my grandmothers hand whipped angel food cake. 🙂 A keeper. Tickled to my toesies to hear this! We are actually serving them at mom’s 85th birthday party in April with mixed berries and ice cream. Mmmm. 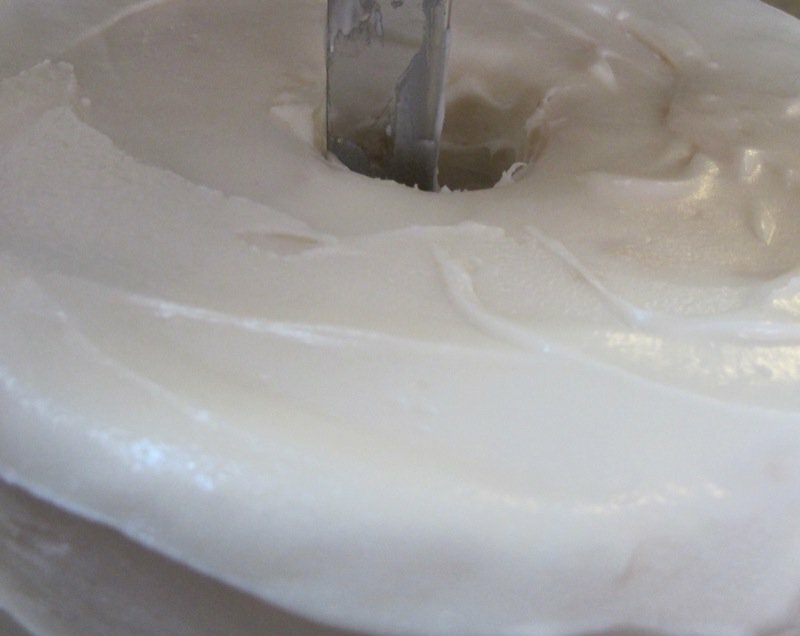 I love the cake with nothing at all, but mom’s almond icing is life altering. Thank you so much for this love story, written for your mother, grandmother, and all of your family. I loved the recipe, and will make it some time soon. I hope your mother and father are still in good health, enjoying their lives, eating angel food cake! What a lovely message! 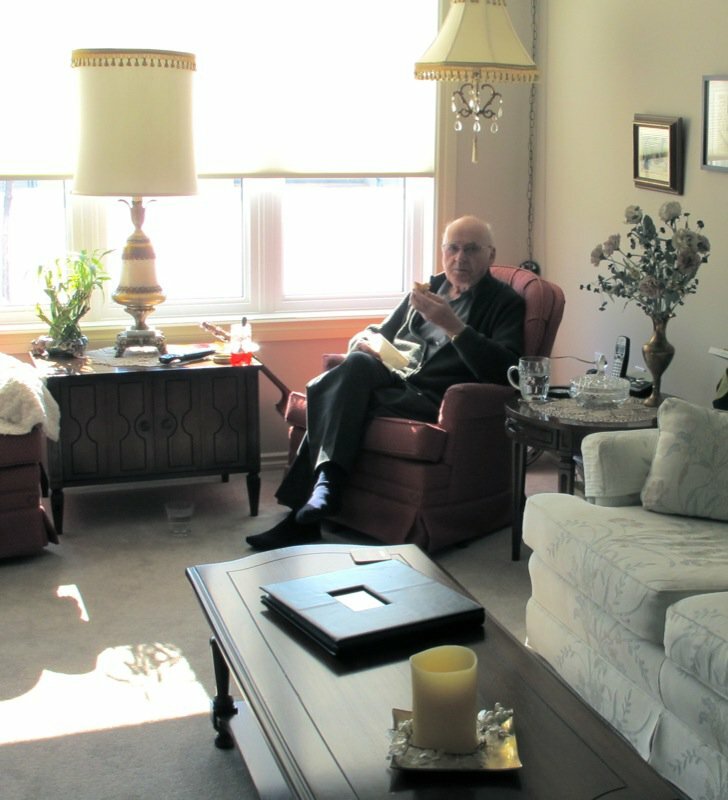 I just published another yesterday with my mom making her famous peanut brittle – and took a photo of my dad’s empty chair. We lost him January 2014. 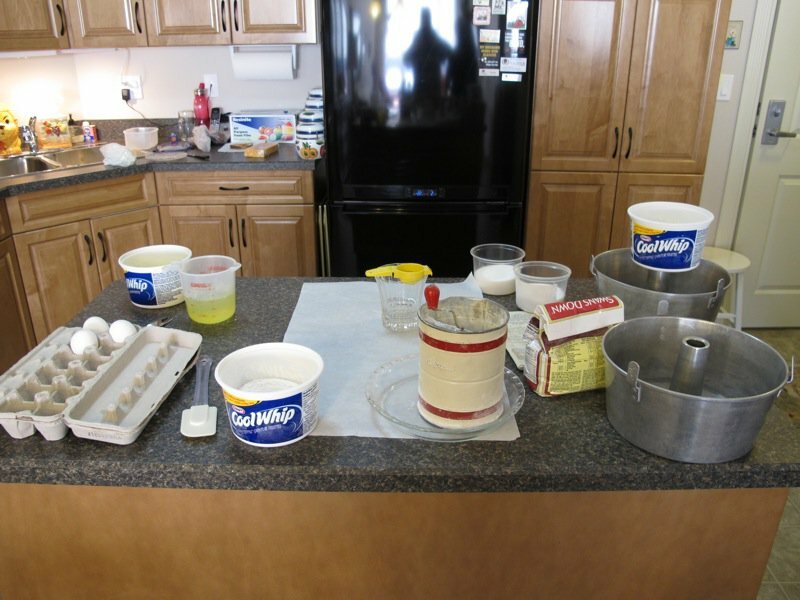 And, I sure miss him – but just thought of him in his chair watching us make this cake as we were doing the peanut brittle…. so this little message is certainly serendipitous. this is great! My mil made the best cake and mine always fall. I am going to practice and practice. Going to make one for my granddaughters first birthday. I need new blades for my Old sunbeam mixer. Any ideas where I can get them? Check GE or Ebay? Let me know how the recipe goes! Oh god. I cried reading your angel cake story. How I miss my grandmother. She raised me and was always there for me. I remember clearly sitting in the countertop making muffins with her, I must’ve been 3 years old. Thank you so much. I needed a beautiful story like this. How touched I was this morning reading your comment. I will give my mother a hug from you! 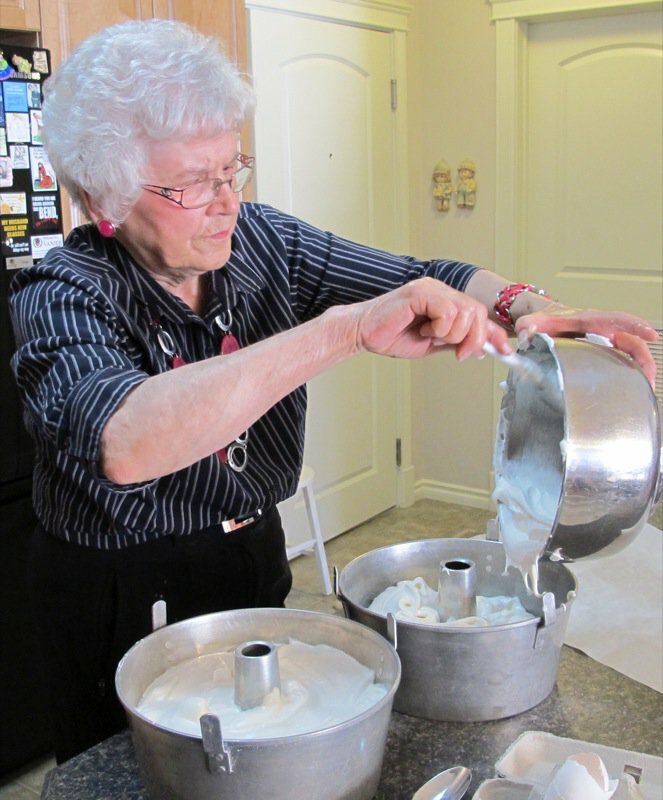 In April of this year (2015) she just celebrated her 85th birthday – as gorgeous and vibrant as ever – and made (in the end) 16 of her own angel food cakes. Each of them was incredible! Imagine! We had a lovely luncheon and the grand finale was her homemade angel food cake with her traditional icing served with mixed berries and vanilla ice cream. Oh, my! Everyone went nuts. I came across this post on pintrest and decided to check it out because of the cheery looking picture of the lady holding the cake. As I read through your post and laughed out loud over the story of your mom running down the back alley to share her ‘failure’ with her sister it sorta reminded me of my own mom (Momma loves her sunbeam too). As I continued reading I was shocked to read that your mom was from Clive! That’s where my family hails from too! I wonder if my great grandma or my grandma got a piece of that cake… small world. Anyway, I’ll be trying your family recipie as soon as I can find myself an angel food pan… or maybe I’ll try that glass trick! Outrageous! Our families will definitely know one another. I have send you an email – sure hope you respond! What a lovely message, Cindy. Thank you so much. Mom will be tickled. 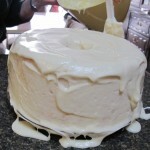 Please do let me know how your cake icing turns out! Dear Valarie. I have made this cake now 4 times! For my family & as a gift for a friend. It is soooo wonderful. Thx again for sharing! Mom will be delighted when I tell her! I can’t wait to try this recipe! It looks delicious! One question – do you measure the flour and then sift, or sift then measure? Thanks so much for your help! 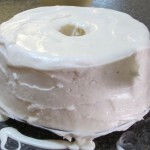 Hi Valerie- I just came across this recipe while looking for an angel food cake recipe as a treat. I’m on a diet (again!) and I’m missing my sweets! My wonderful Mom is 86 now and doesn’t do much baking but she is my dearest friend. We lost my dad a year ago this month and she’s been having a hard time missing him after 67 years of marriage. I think she would love your mom. Thank you for sharing this recipe and your story. I’m making this tomorrow! How wonderful to hear from you! I gave up on diets years ago! Good for you! Where do you live? Inquiring minds want to know! Good morning, Valerie! Just wanted to let you know the cake was fabulous. The only thing I did differently was the frosting. I made a maraschino buttercream frosting just because I was in the mood and had the cherries. Naturally, this made the angel food cake NOT so diet friendly but it was yummy! I guess that’s why I’m always dieting, usually unsuccessfully. You asked where I was from. I live about 45 minutes southeast of Pittsburgh, Pa. Have a wonderful day. 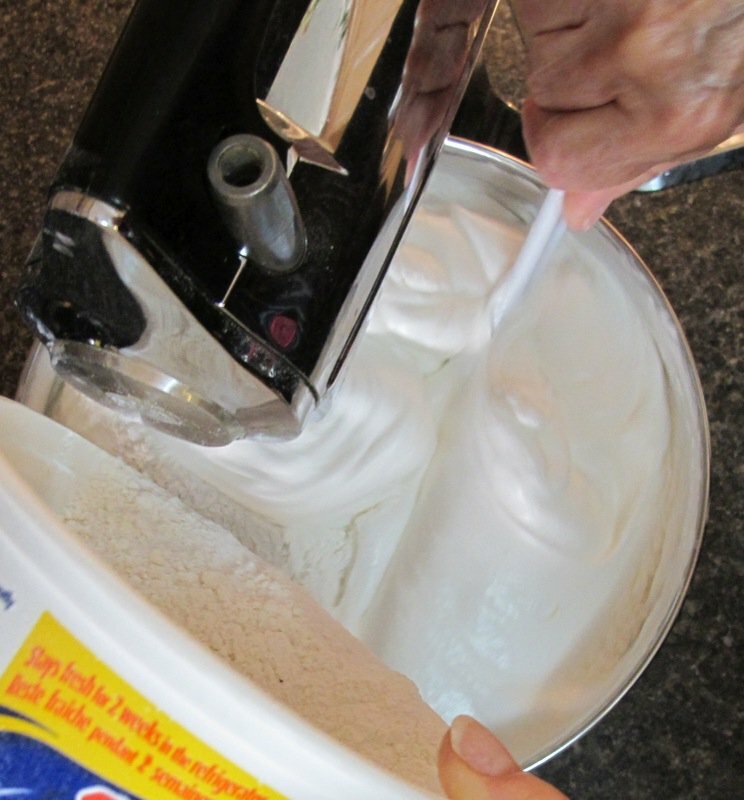 You will have to try mom’s icing someday – it is the favourite part for some! I also must now have YOUR icing recipe. It sounds divine, as well! Thanks for letting me know where you are from! I don’t usually read s whole story unless it catches my attention and this certainly did. I love how you did this with your mom. 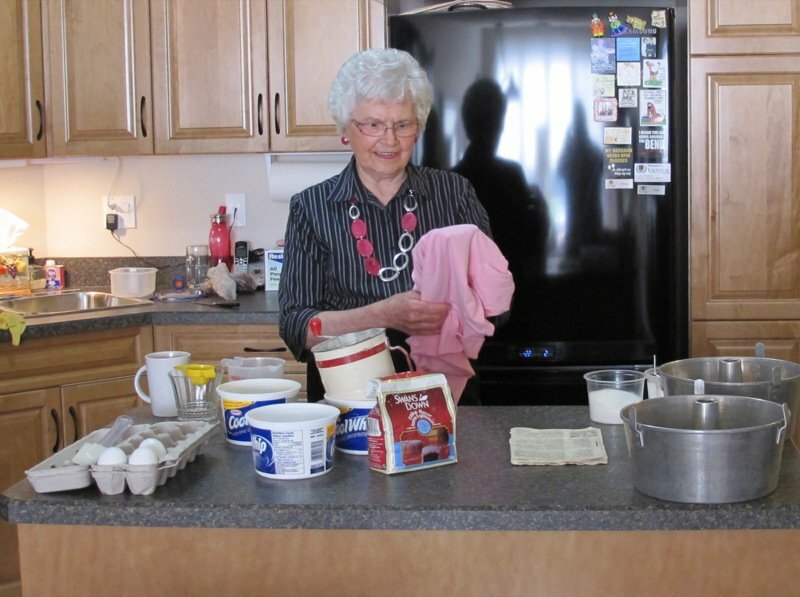 My grandmother had some wonderful recipes that were lost with her and I’ve had to guess how to make them. I’m so happy you shared with all of us. My dad comes from Canada. I remember visiting when I was a teenager and was fascinated by the warmth and generosity of the relatives I didn’t really know. They made me feel like their home was mine. I loved it. Was there a video link posted? I thought I had seen a video before and now I’m not able to locate. traditional recipes is exciting to me. I know. I get my pleasures in odd ways. Have a great day and hope your cake turns out well! Thank you for your response, I can stop searching now lol! I wanted to make your mom’s cake as soon as I read your blog, but just now having the chance for a family gathering. It looks fabulous and I can’t wait to try it. Mom will be over the moon to read your comment and sweet words. Thank you ever so much for taking the time to write them, and more importantly – to brave your way through the angel food cake making process. It is SO worth it, isn’t it. Once the fear is dealt with, it is almost easy, no? 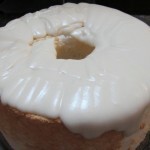 Now, I would LOVE a copy of your treasured pound cake recipe if you would be so inclined to share? Mom and I were in New Orleans in January of this year. We understand it is a huge state, but loved our short visit there! 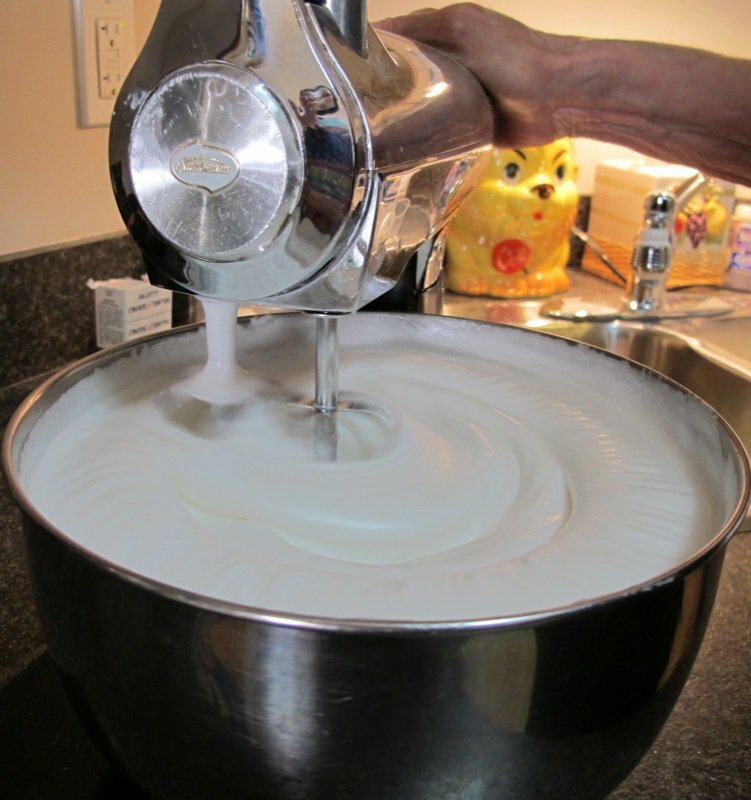 My mom used this recipe for 55= years ever since she bought a new Sunbeam mixer and tired the angel food cake recipe. 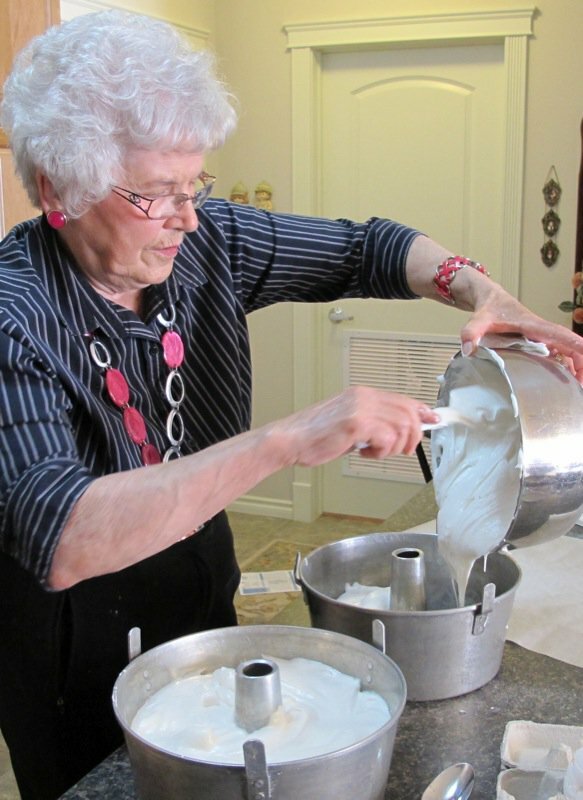 she was well known for her angel food cakes. To make a chocolate version, decrease flour to 1 cup less 1 tbsp cake flour and sift in 1/4 cup cocoa powder with the flour. Also add an additional tsp vanilla. Wonderful. 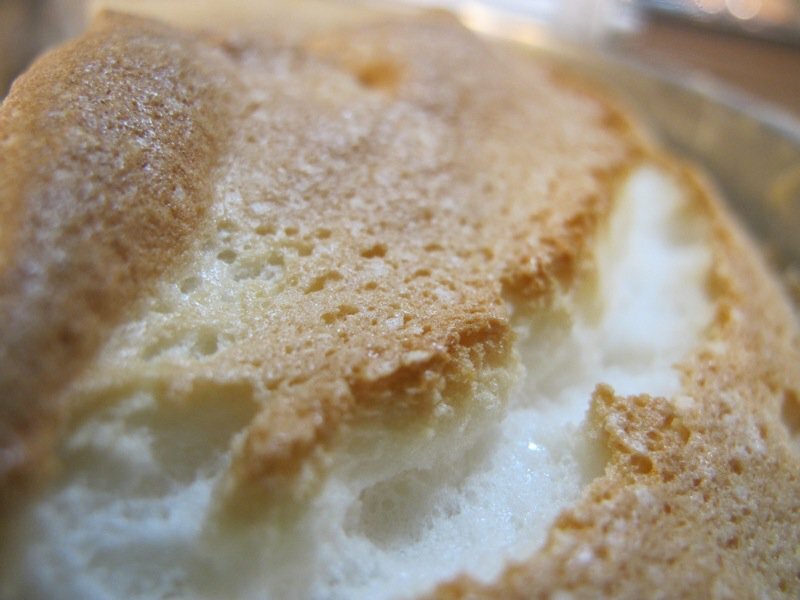 I still use the recipe myself, and now I’m known for my angel food cakes. Do you still have your Sunbeam, Maxine? That was a fantastic machine. Mom had hers for a thousand years. It was quite an adjustment for her when it died. 🙁 Thank you so much for chiming in. 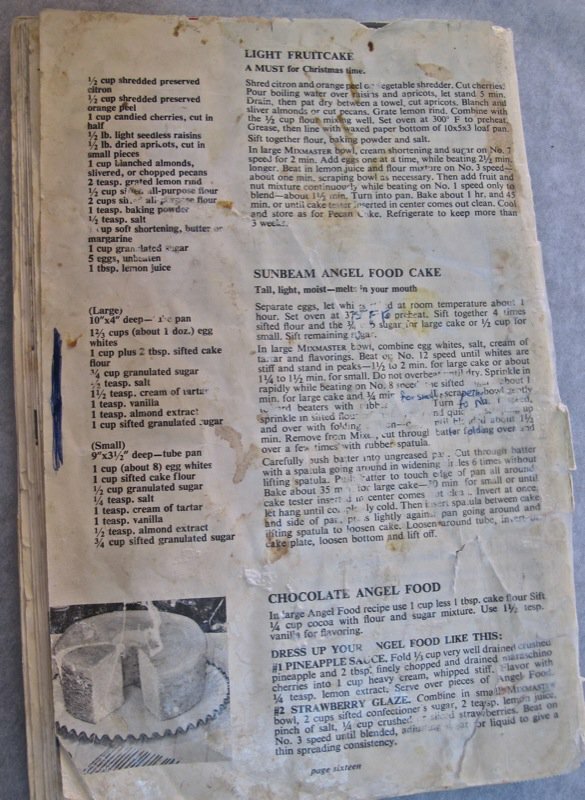 We are not chocolate angel food fans – but mom would carefully cut out a square for special occasions and stuff it back with a mixture of condensed sweetened milk and strawberries an whipping cream – it would slice beautifully and was so beautiful and tasted delicious! I know this post is fairly old now, but seems to still be popular. 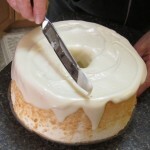 My husband only likes angel food cakes, and he turns 28 on Thursday. I want to make one for him, but mine always end up being really short and dense. Any idea what is causing that? I will definitely try your recipe this time. I believe I have used all purpose flour in the past. Could that be why they are always short and dense? Also, why is the flour for the first cake sifted 3 times but the flour for the second cake is only sifted 2 times? Both cake flours were sifted three times, Mariel. That may have been an error, or the flours may have been divided after the first sifting. The cake flour makes ALL the difference with this cake. It is just not the recipe. Think bread. 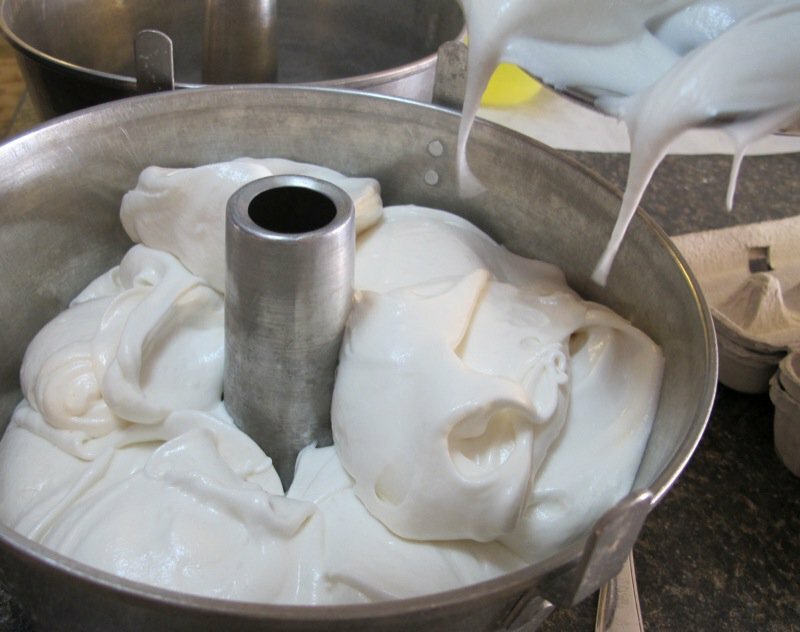 The recipes for doughs have 4 ingredients: flour, water, salt and yeast. Yet, it is what the maker of the dough does with these four ingredients that creates such a vast array of differing breads. With this cake, it is the same. 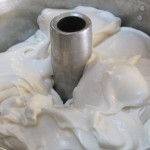 The specific ingredients and the recipe is important, but the technique is equally important. I hope you let me know how it goes for you. To me, this is the best cake, too. Absolutely the food of the angels. I hope your mother is still doing well. She looks like a lovely woman. I am a Canadian living in Tennessee and this whole story made me terribly homesick. When I was small (I am now 70) my family would gather for special times like this. No one does it anymore and it is a shame. I will try this cake. My mother made one once long ago. I can still see it inverted on the neck of a bottle, cooling. She liked to try making new things. Thank you for taking the time to tell this story. My mom turns 86 this April and is thriving. I believe she will live to be past 100. We are very lucky. She still bakes these cakes regularly and gifts them to all she loves. I am happy to be on this list as no one can make these like my mom. Well, my daughter and I can – and I suppose, you, too – if you follow her recipe carefully and practice! Please do let me know how your cake turns out. If you make it once, I am fairly certain, it will not be the last time. And, do make her icing. My girlfriends fight over it! I didn’t have as much icing as your mother’s cake showed. The recipe says 2/3 cups butter. When I read the test I noticed 3/4 cups. Wonder if that makes a difference? Can’t wait to serve it for my husband’s early birthday celebration. So wonderful to still have both or your parents and that they are enjoying life! Good question, Susan! I had not noticed that, but am waiting for my mother’s answer for you. Dad passed two years ago, now… but his memories live on in all we do! She made icing for 2 cakes, remember? Maybe that’s why you didn’t seem to have as much as she did in the photos. 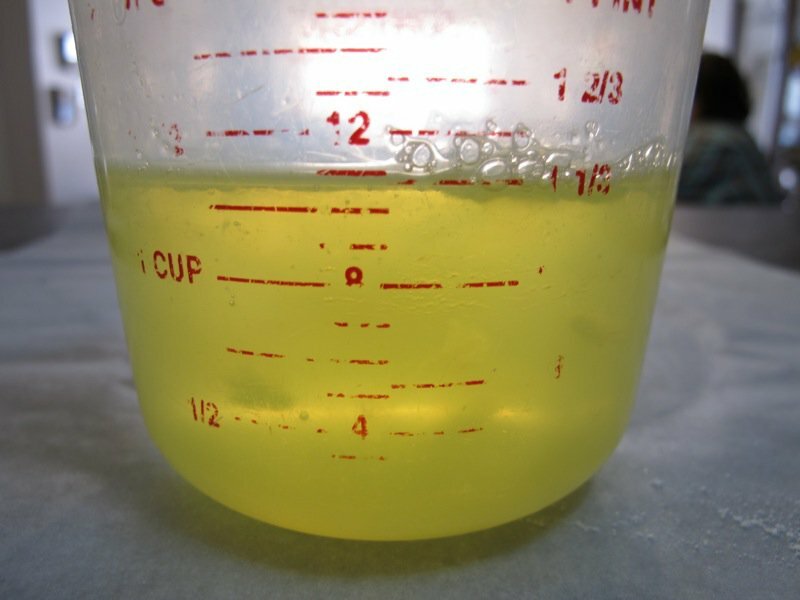 Will get back to you about the butter asap, but I am imagining you do an amble 2/3 cup – and 3/4 cup would be scant or exact… we’ll see. Mom has said the 2/3 cup is the correct amount and that she just offers a little generous mound on the top of it. She wants all to remember she ices her cakes frozen, always – which is very important. 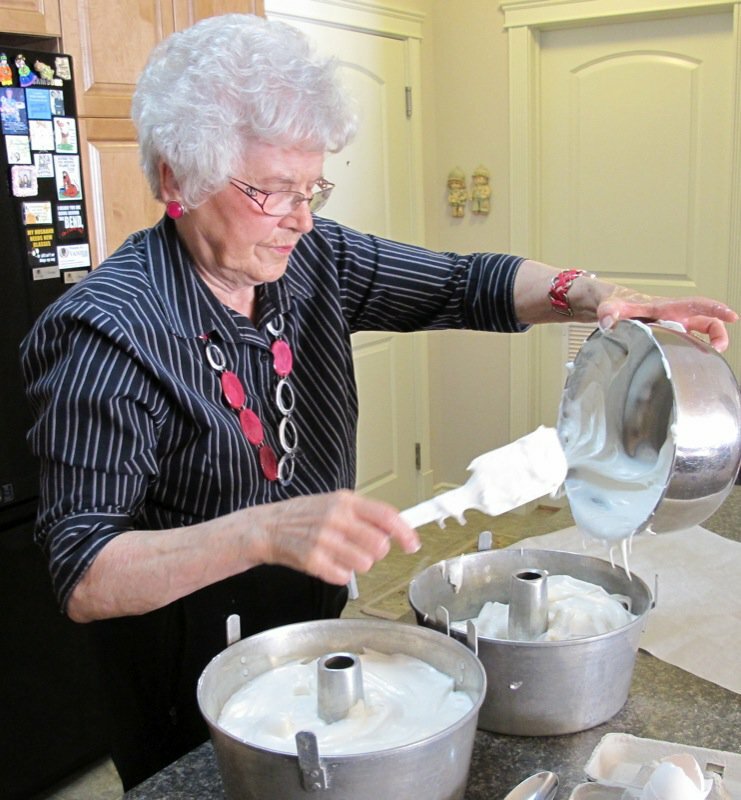 She mixes her icing to a loose consistency and it will harden on the cake. 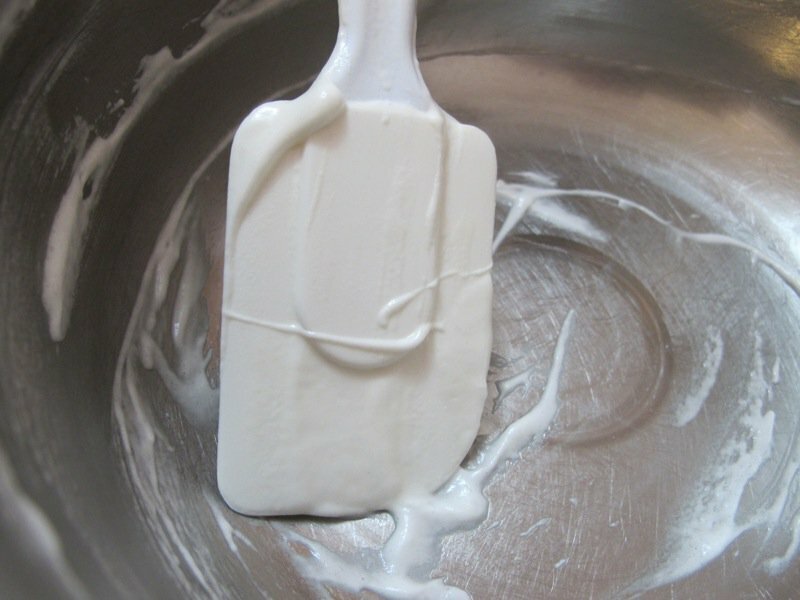 Not to a royal icing consistency, at all – but it will firm up, for sure. Delicious! Hope this helps, and do let me know! Would love a photo of your cake! What a gift. 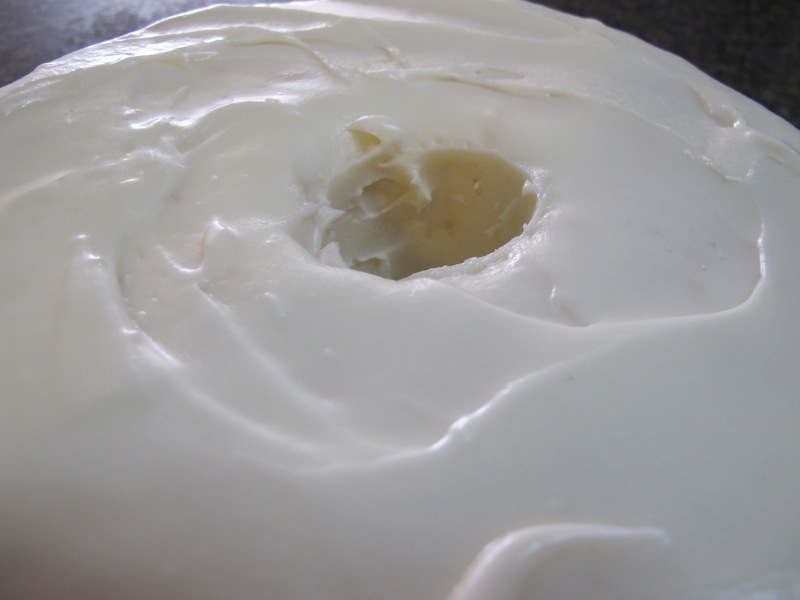 I was just writing a response to another gal about her question about the icing… and your comment popped up. Mom delights in hearing these stories. I am so glad to hear this. I also love it as the angel’s food it is! 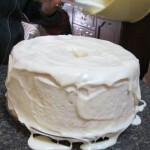 Yet, if you ever have extra time, the icing mom makes is also scrumptious. 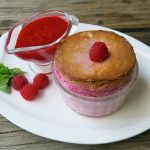 When she has angel food cakes that she makes that don’t reach her standard in height, she freezes them and we eat them with fresh strawberries… or raspberries – or, as you have, with nothing. And not on a birthday, either – so that is an extra special treat! What an awesome and beautiful posting! Your Mom looks angelic and twinkly light spirited . . . .I feel her love through the screen and celebrate her presence. 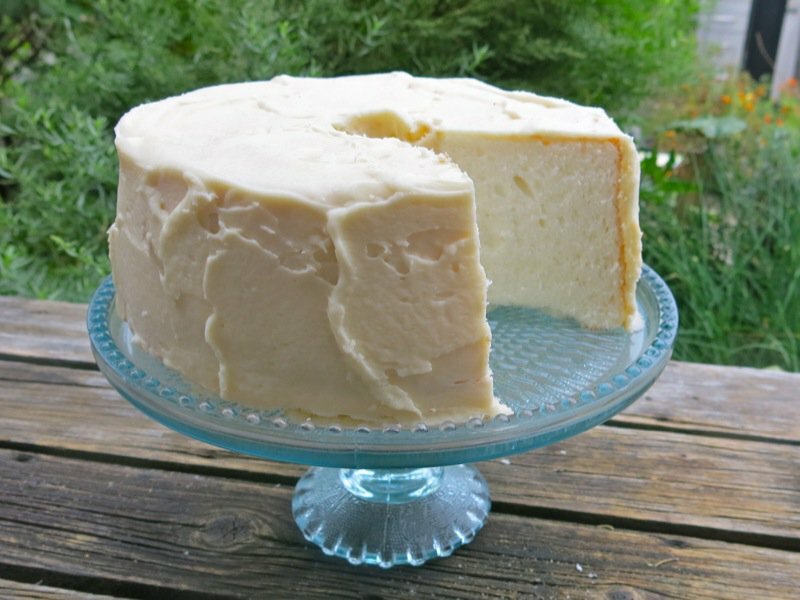 Will be baking this today for my husbands birthday, it is his favorite cake and ordinarily I’m not excited to make it, but this sharing and your Mom have inspired me to happily bake him a labor of love. Thank you so much! To your health and hers~Salud! What a lovely gift from you this morning, Creekrose! I hope you make some time to let us (mom and I) know how your cake turned out and how the memories were built through your celebration effort! A fabulous story! Thanks for sharing. Your Mom does NOT look 80 and she is beautiful! She is 86 in April 2016 and still looks exactly the same. She will love to hear this, Jackie. 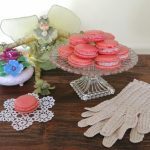 Darling story and wonderful recipe! 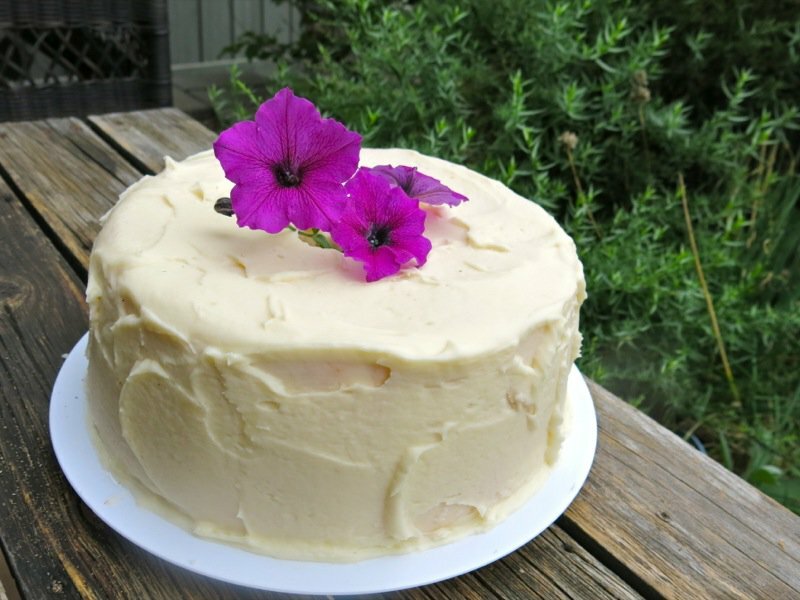 I almost cried at the picture of the dishpan cake with flowers, unbelievable! I thought of your mother making these as I folded the flour mixture in by hand and had to take a break, how does she do it?? I’m making this cake for my own mom’s 59th birthday tomorrow and plan to put a lime icing over, lime is one of her favorites! I hope to save this recipe and imagine my own daughters (due with number three in June!) making it for my 40th, 50th, 60th…birthdays in the future. And of course, now I am crying! Thank you for the thoughtful post and sharing your memories. Mom just got on the plane to go to Los Vegas this morning. 86 years old in 2 weeks! 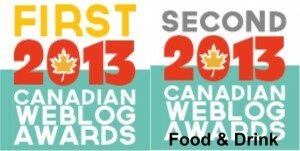 I am about to post her Canadian Prairie Dinner Bun recipe. 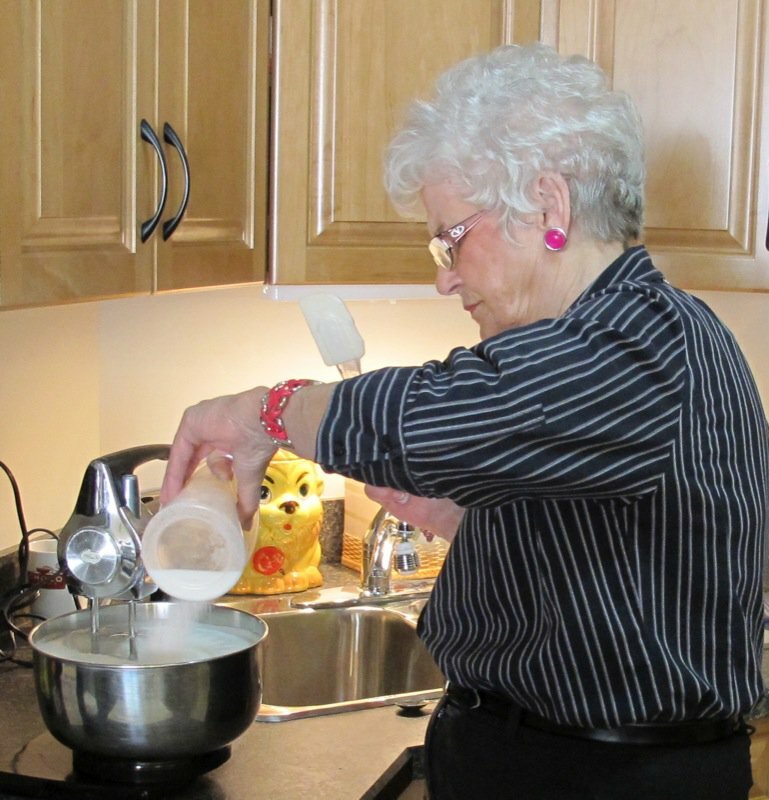 She is an amazing woman and provided a spotless home with a delicious meal on the table every night of the week. Her food is worthy of the Queen. That is for sure. She will be deeply touched by your comments. Thank you for chiming in!!! 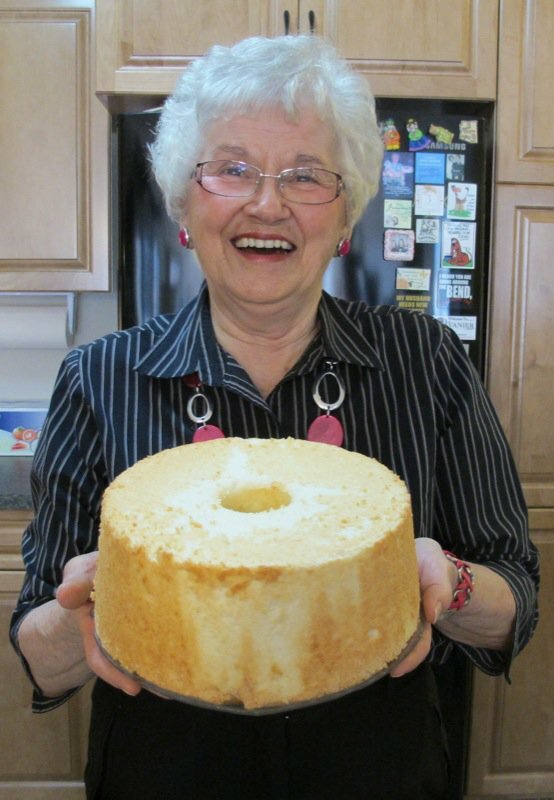 I turned 60 last summer and she made ME an angel food cake. She is 86 in two weeks and still going strong! Wow! 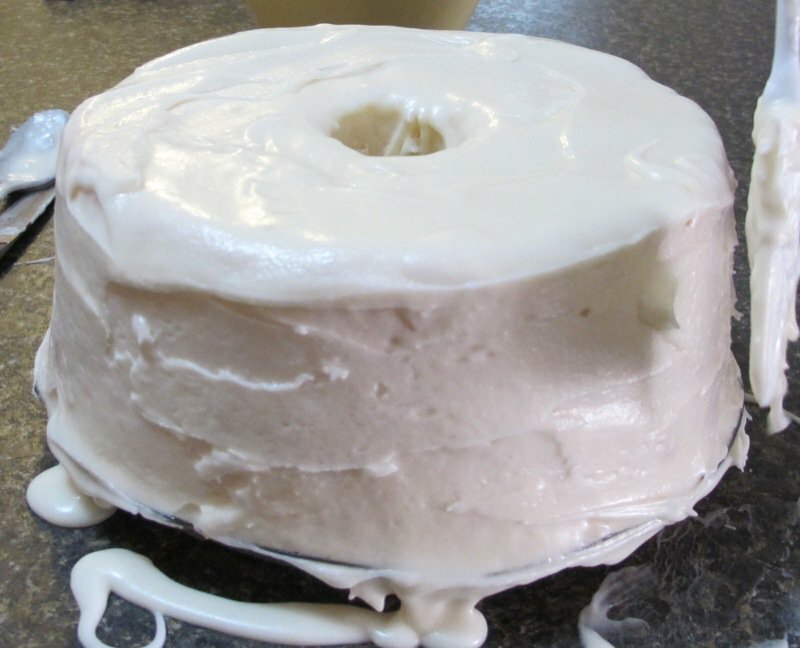 This sounds like my own 86 year old Mom who used to whip up high as the sky Angelfood cakes like this…Same brand Cake flour and yellow Tupperware egg seperator that was a Tupperware party prize. Just like mine, had it since 1975!, Have that same sharp metal edge pan as well. Your sweet Mother reminds me so much of mine. She is gone now but I would love too have the chance to make her this cake. Thank you for sharing such an incredible story about an incredible family as well. I will think of your Mother when I make it! Loved it all. Thank YOU so much for leaving such a touching comment. My mom is bringing me over 2 cakes tomorrow for a baby shower I am hosting on Sunday. My little grandson is here visiting with my daughter, her husband and his mom. Mom has made 2 apple pies, her also famous chocolate cake with brown sugar icing and a rhubarb cake. Today, she had my two daughter’s and Aaron’s mom over to her house for a bowl of her homemade borscht for lunch. Do you believe that? She was 86 in April and there is just no stopping her. She will take such pleasure in reading your kind words and we hope you let us know how the cake goes for you. PS – where do you live? Canada? US? Australia? Valerie, I meant to lea e five stars not four! Also, my mother was an almond nut…put it in everything. I am almost as bad, and my Maltese looks just like yours! Or is yours a Bischon?.They often get mixed up if they aren’t as curly.. He is one of four we have had over they years and yours looks so much like my Bubba. Just a little side note! 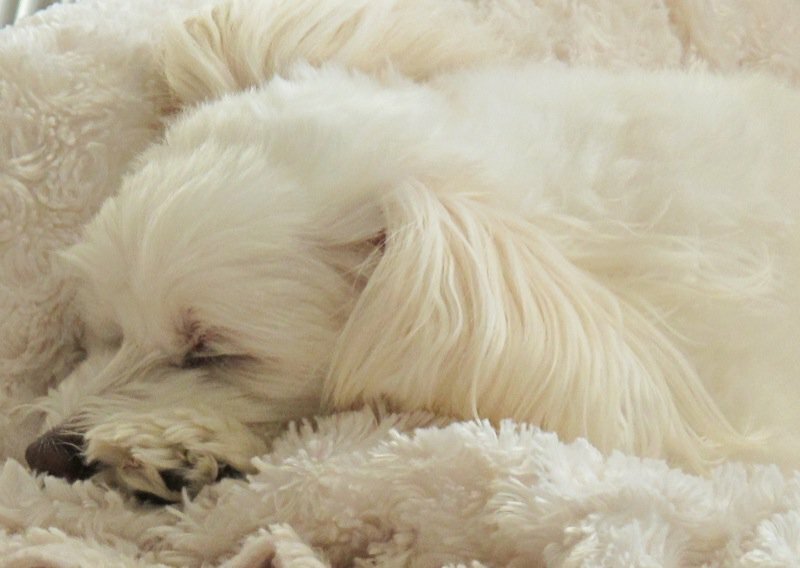 Penny is a little mix, but mainly Maltese. She is 16 years old now. Very hard of hearing. Can’t see much. Eyes are very cloudy. 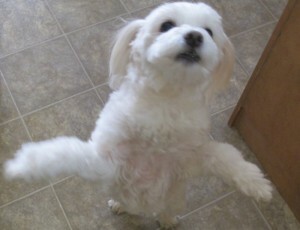 But she is like a young little pup in the morning when it is time for her walk. 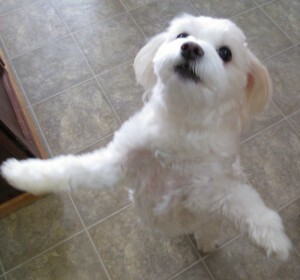 She dances and prances. We just cannot get over her in the mornings. 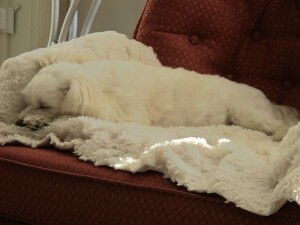 Then, she sleeps most of the day. 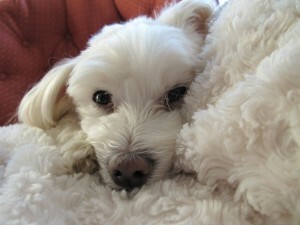 As she is so old, mom no longer gets her teeth cleaned and she has really bad breath, but we love her enough to bare it! 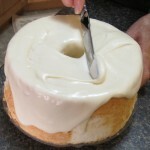 I wanted to write you a note thanking you for your post about the Sunbeam Angel Food Cake. 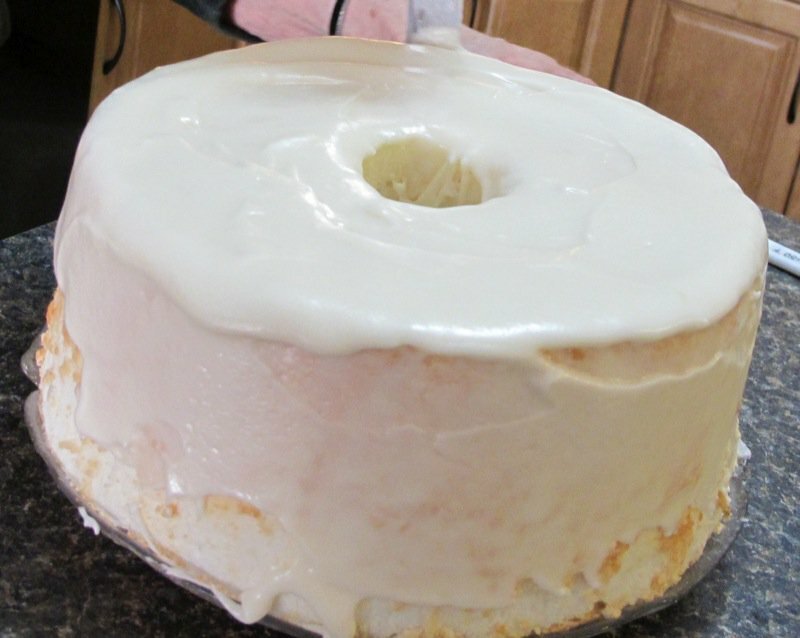 My grandmother was a wonderful baker and this Angel Food Cake was what she made for every family member’s birthday. It is nostalgic and delicious and the perfect cake for the majority of our summer birthdays. We typically skip the icing, in favor of strawberries and vanilla ice cream. 🙂 Unfortunately, after she passed and I received all of her recipes, this one had been written in short-hand and was illegible from years of use. My mom and I tried several times to find the original recipe. 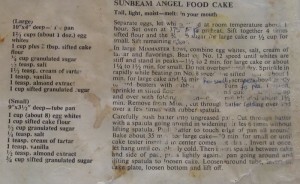 We actually found the Sunbeam recipe book, but were disappointed when the cake came out deflated. Nonnie’s cake was always min. 4″ high. 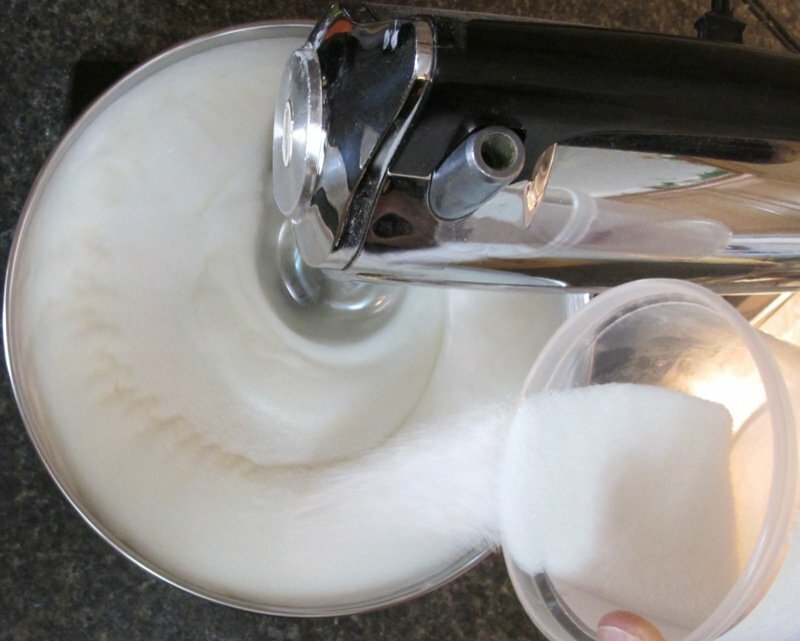 And then I found your post – it was so incredibly helpful to see the exact stages of the egg white and when to add the sugar vs. when to add the flour mixture. The Angel Food Cake has once again been revived in our family and for every birthday we now have the opportunity to think of Nonnie and I know she would be proud to see that her tradition lives on. For your heart warming words and story. These are the magic moments that tie those from our past to those in our future. It is these kinds of stories, and memories, through food, recipes and family time around the kitchen table that builds that strong love that binds. I am so tickled your cake is back! I enjoyed so much reading your family history! I come from a family of cooks and wrote a cookbook with family history several years ago. 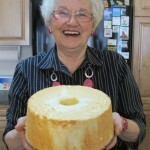 I copied your angel food cake recipe and put the picture of your mother holding the cake with it. What a great Mom you have! Reminds me of my mother. We were planning her 90th birthday party, and I would ask her, “Well, Mom, what are you going to cook for your party?” Sadly, she died at age 89, but I am so lucky to have so many good memories of her. Thanks for sharing the story and pictures. What a story! What did your mom say? What did she plan to cook for her party? We are actually going to have mom’s 90th a couple of years early so we are sure she is there and all plan to go somewhere to an all inclusive resort as a family. I sure hope we can make it happen. Thank you so much for connecting. Hi! I’m doing this wonderful cake for my mother right now for Mother’s day:) I wish that mine will be nice too…! Thank you very much and happy Mother’s day! What a lucky mother! Please do let me know how it turns out. 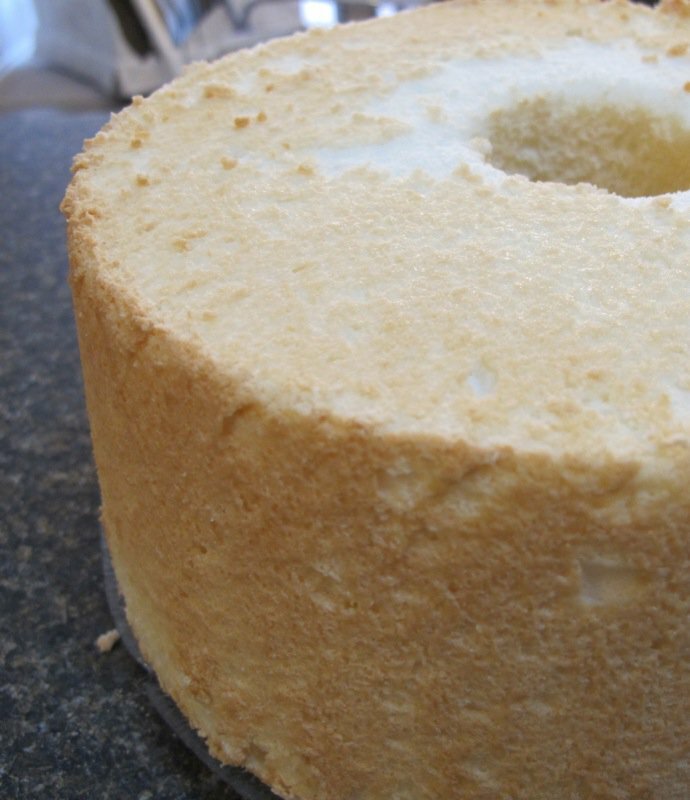 To me, there is nothing as special as a homemade angel food cake! 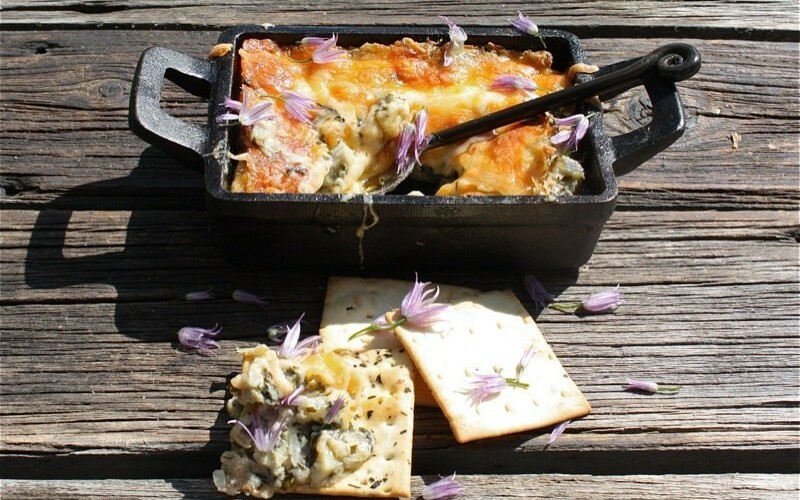 I see you are from Québec – and I am always looking for traditional family recipes from all regions of that province if you care to share a favourite or two! Hi! In the picture tutorial it says to add the cup of sugar when the eggs are frothed. Then in the directions it says when the eggs are stiff.. which should I follow? It is both, Amanda. Take a look at the ingredients. There is 3/4 cup and then a cup sifted. What a wonderful tribute to this cake and the others you have met and loved, Nancy! Been to Carmel, but missed that cake! I love the story about the cake keeper cake! Let me know if you make this and how it goes for you. I think you will be forever hooked. 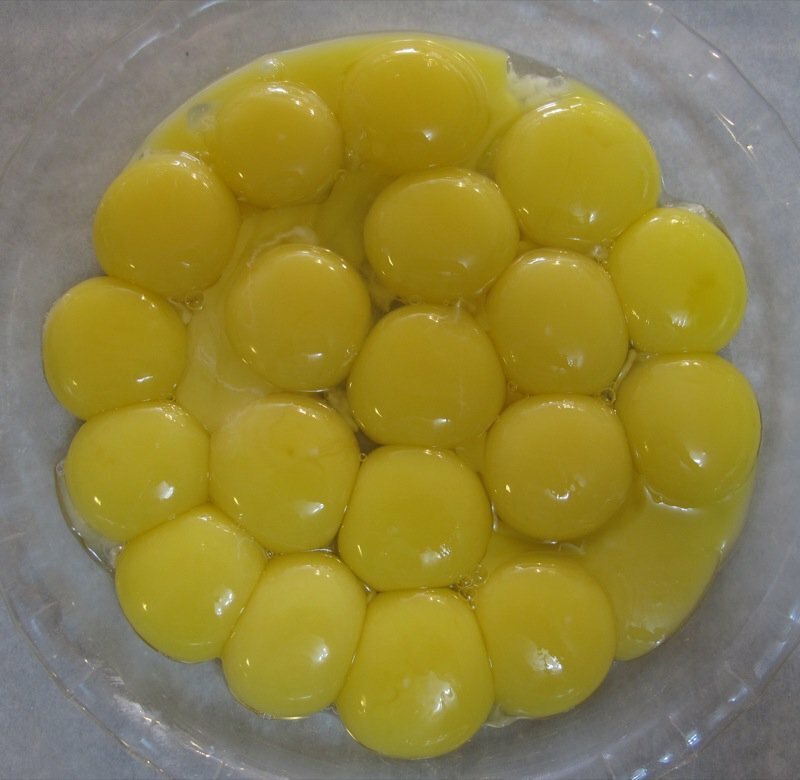 What do I do with the yolks? 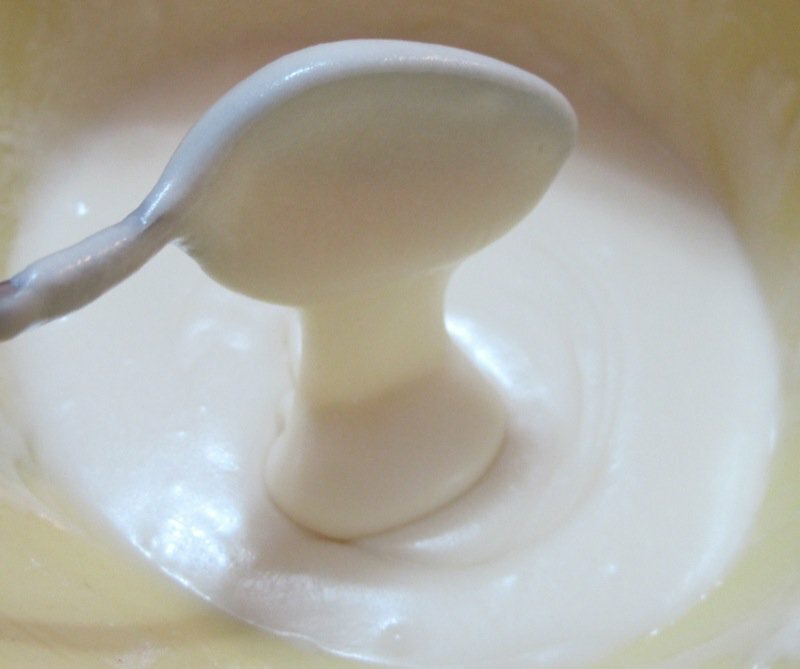 Different things – make ice cream, lemon curd – or freeze them in ice cube trays – one each with a pinch of salt on top, then wrap individually and place in zip lock bags. They work beautifully in recipes that just call for a yolk. Thank you so much, Jacque, for the lovely sharing of yours, as well. I am currently away in the US, but do hope to pop by your site when I get home. I’d love to know you your cake turned out! Thanks so much for sharing your grandma’s recipe!! I was hesitant to try it, because it was my first time making angel food cake, but I’m glad I did! I followed the recipe exactly and it turned out beautifully!! It was a huge hit!! I am so happy to hear this. My mother will be over the moom. 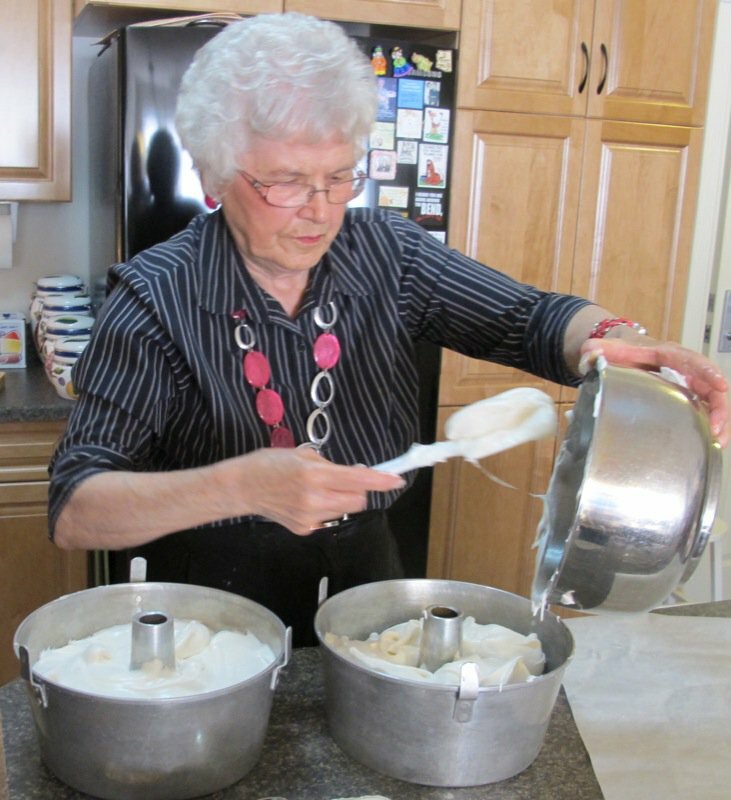 She turned 87 in April of this year (2017) and we were just in Salt Lake City for the Blessing of my Granddaughter – mom took 4 of her now famous homemade angel food cakes for the after party. She did the same for William, 2 years older, 2 years ago! What a gift! Just came across this while surfing Pinterest. Love, love, love the story! I hope you still have your mom around baking her cakes. My mom and I make very fancy Christmas cookies each year and give most away to friends & co-workers. 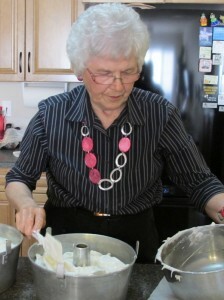 My mom is 92 and I am so lucky she still can cook and bake! I don’t ever remember a time when we didn’t make Christmas cookies–so family traditions are important! 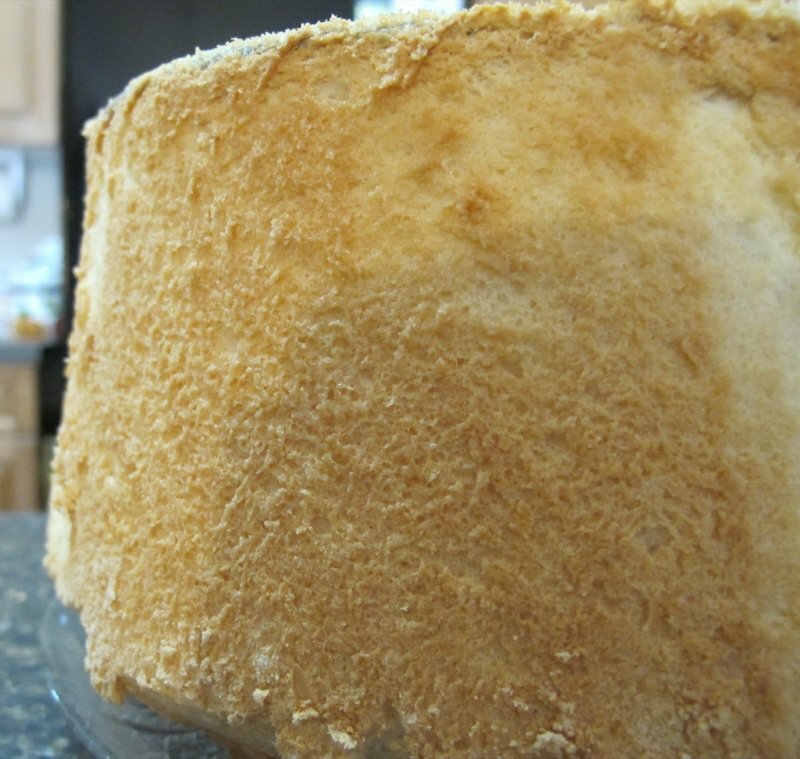 I really like Angel food cake and will definitely be trying your recipe soon. Best to you and your mom. Mom will be thrilled to read your comment. Yes! She is still with us, alive, and thriving at 87. Still stirring and whirring in her kitchen. Not as much as she used to, but she still can’t resist the urge when seasons change to do what she’s always done. And angel foods? 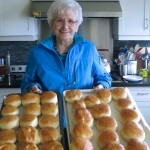 Still as perfect as ever and just made a truckload of her famous hot crossed buns last Easter for her turn with treats at her condo on Coffee Day. She does stollen at Christmas and the buns every Easter for over 100. I’m checking your cookies out now. 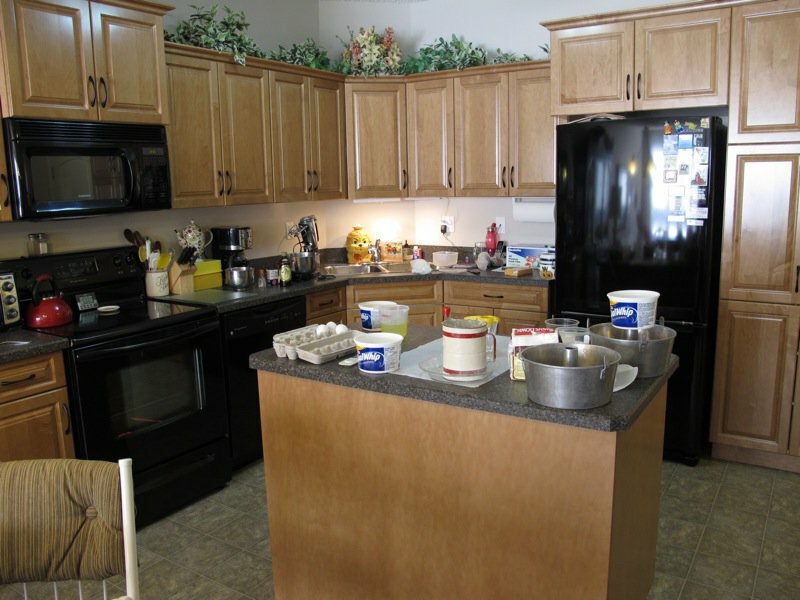 Could not find your Christmas Cookies anywhere, but can you bake pies and cakes! WOWSERS! I sure hope you will share the recipes for the cookies your great grandmother was making and for the cake I asked you for. I failed to mention that though mom and I don’t bake Christmas Cookies together, we both make them – and I would be thrilled to hear your comments about ours. 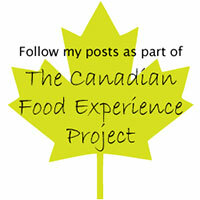 Just search: “Christmas Cookies” on my seach box, top left – or google: “A Canadian Foodie Christmas Cookies”. What a fantastic story. Wish my dear mother was still living. I loved this posting. 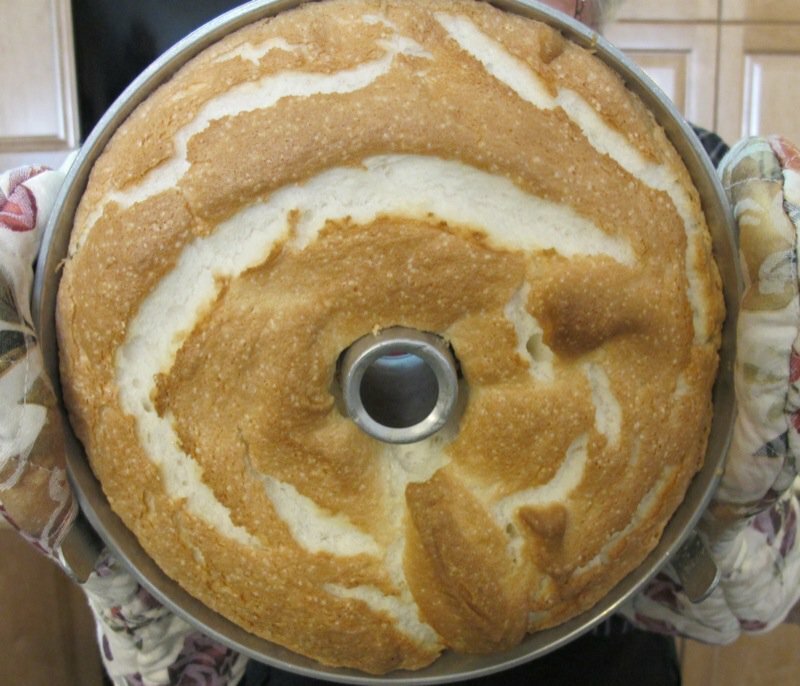 I bake angel food cakes for the local county fair. Your Mom is amazing. God bless her and I wish her many more years of baking. Thank you, Jayne! What local county fair do you bake cakes for? Lucky attendees? I would love to know where you are from. Mom will be tickled to read this. Thank you for taking the time to post this. 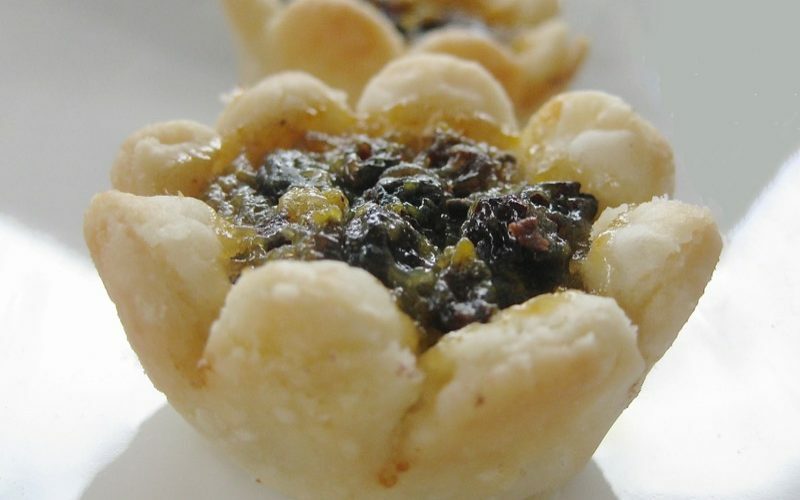 My grandmother, from the Kootenays in BC, used to make this same recipe all the time throughout her life. Both my mother and I have fond memories of this spectacular cake. My grandmother bought a Sunbeam model 12 Mixmaster in 1957 while on a trip to Spokane. It was a huge splurge for her at the time as they were not wealthy people and it was expensive – she even paid an extra $10 to get the chrome version instead of the white one. 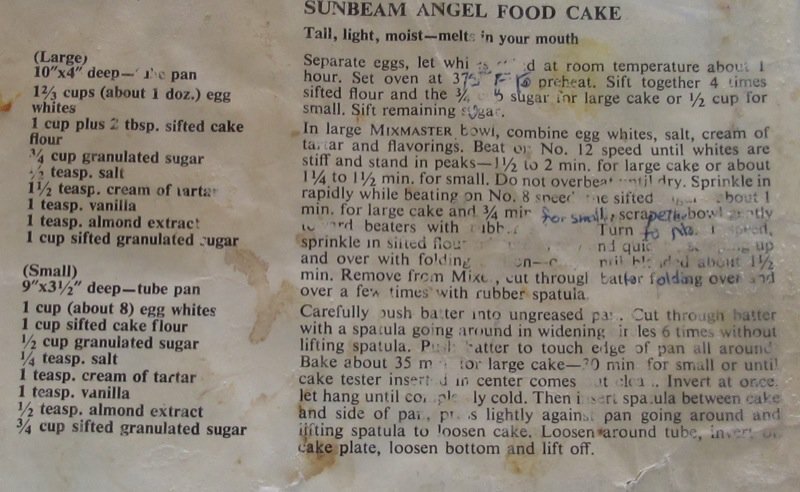 The Sunbeam cookbook, just like your mothers, has some great recipes in it and my grandmother swore by the angel food cake. 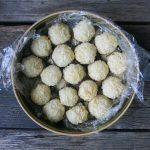 I originally came across this post while looking for the same Sunbeam recipe on the internet as I hadn’t had it since she passed away in 1997. My mother and I made this a few months ago using a Kitchen Aid and it turned out well. However, we decided to try it again just recently and dug out grandma’s old Sunbeam to make it this time. I can’t believe its still going strong after all these years. 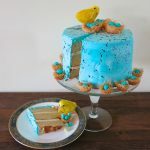 I can tell you, there is something just a bit better about the way it turned out in the Sunbeam – not sure many others would notice but my mother and I also grew up on this cake and could discern that little bit of difference it made. Maybe it was just the nostalgia though! Thank you again for posting this. Although we still have the Sunbeam in the family, the recipe book seems to have vanished and so your posting made it possible for us to relive a bit of family history again. 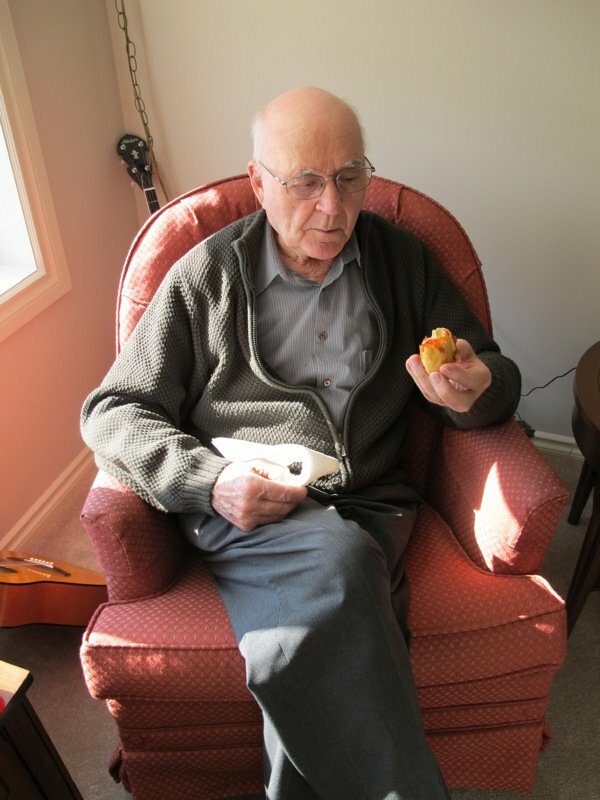 Thank you, so very much, James, for taking the time to share your family’s angel food cake story. I was touched by it and I know my mom will be! She is still going strong… 87 this Christmas and 88 in April. I simply cannot keep up with her. 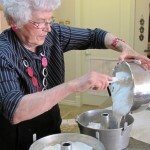 She still makes these cakes at least every couple of months – and always 4 at a time. What a lovely story! Great way to keep it going! My mamaw Helen (no relation, lol) used to make us special recipe Christmas cookies. She would wrap Christmas paper around the outside of Crisco cans, then she’d fill them with our cookies…it was such a special thing she did. We were very poor in WV and very rarely had gifts under the tree. Most of them were thrown out toys the Woolworth’s Woolco tossed in the trash because something was damaged on the toy. My mamaw would climb in the dumpster and retrieve toys to give to us for Christmas….and the cookies always accompanied! What a lovely sharing, Patricia! This cake turns out just beautiful and delicious. 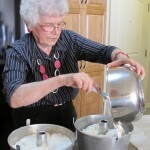 Love the legacies of those veteran cooks and bakers that give us the secrets that make it just right! Mom will be tickled to hear this, Brooke! 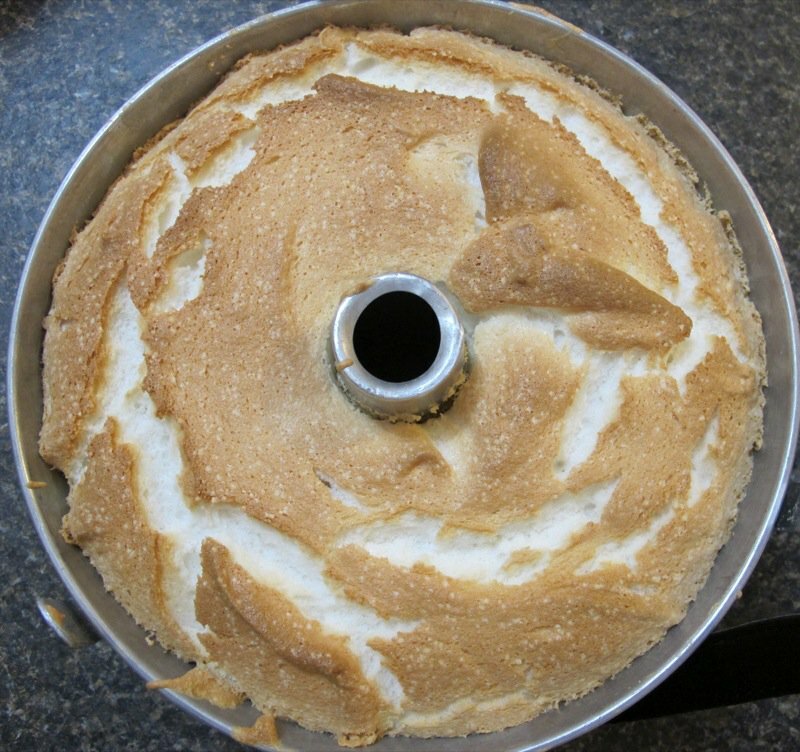 So, angel food cake is one of the few desserts my husband likes, plus his grandmother gave me her vintage angel food cake pan shortly after we got married, so naturally I figured I’d need to learn how to make a good one. A few months ago, I started looking at recipes, and your blog post made me decide to try this one first. It’s stood the test of time, and I love a good bit of family history! So today I tried it out, and I don’t think I’m going to bother with any of the others. Your directions were so easy to follow, and the cake is SO delicious! Thanks so much for sharing it! Small world…I came upon this blog on Pinterest and I’ve met your mom. She resides in the same complex as my mother-in-law, Sonia White. Your mom is very well known for her wonderful baking she shares with the others. So happy to have come across this on Pinterest. Is that not amazing, Denise. Know Sonia very very well! 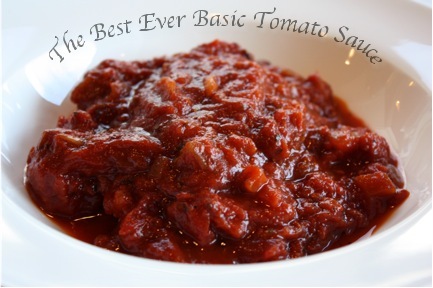 I am so glad i looked at this recipe and was able to read your wonderful blog filled with love. My Bubby Hannah passed away when I was very young but I remember how she loved to bake SPONGE CAKES. I wish I had been able to get her recipe to make her cake and feel the special Love you experience with your Mom’s cake. I love to bake and mostly give everything away. It makes me feel happy when I share what i make with others. I can’t wait to make your Mom’s recipe. Reading all these posts put a smile on my face . My mom will be tickled to read your comments and the story you have shared, Susan! Great big hug to you, and thank you!! I was so happy to read this article. The cake sounds delicious. I have never tried to make an angel food cake from scratch, but will have to try this one. I have worked on genealogy for over 30 years. My husband’s name of Morrical was a good place to start, since it is more unusual. I have lots of information about the family. 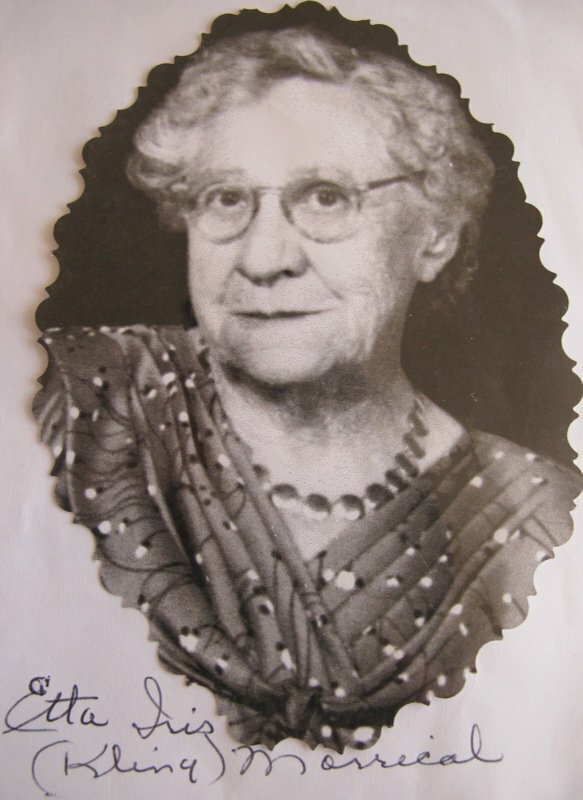 I have a copy of the individual picture of Etta Iris in my records and would love any more information about her. I sent a copy of our book to someone in Alberta quite a number of years ago, and they gave me lots of information. It is always exciting to find family. Lovely to hear from you, Sylvia. I emailed you, but you didn’t respond. Maybe check your spam? 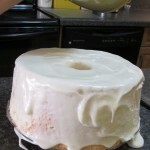 I came across your blog post covering your mom’s angel food cake recipe on Pinterest. My fiancé has been craving a homemade AFC and I had no idea where to start. Your blog post made me smile and I just knew it was the recipe to try. I followed it to the T (even to the point of purchasing a Sunbeam mixer). It was PERFECT! Light and fluffy with a crispy bottom. My fiancé told me it is the best cake I have ever made for him! I can’t thank you and your beautiful mom enough for sharing not only the recipe, but also the tips and tricks to making a perfect AFC. My own beautiful mother passed away a few years ago, but I keep her memory alive by baking her famous apple pie. Aren’t we lucky to have mothers with such talent? Thank you both again for sharing this. Now that is a first! Buying a Sunbeam! I don’t think they make them like they used to. My mom’s first one lived a great life for over 40 years! Tickled you and your fiancé loved the cake and that the instructions worked well for you! Maybe it will become your family birthday cake, too? It is certainly iconic amongst our family and friends! Wonderful to hear this, Lorrie! Mom will be thrilled! What a wonderful story and cake legacy your family has! I thoroughly enjoyed reading this post. I will try to make this cake but I am certain that I will not be as successful as your beautiful mom! I always worry about that, myself, Clyda! Will I ever bake an angel food as good as mom’s? She is 88 this year and still baking them regularly and they continue to be spectacular. This will warm her heart! Glad you got that sorted out, Angie! This recipe is amazing! I’m so glad I found it. 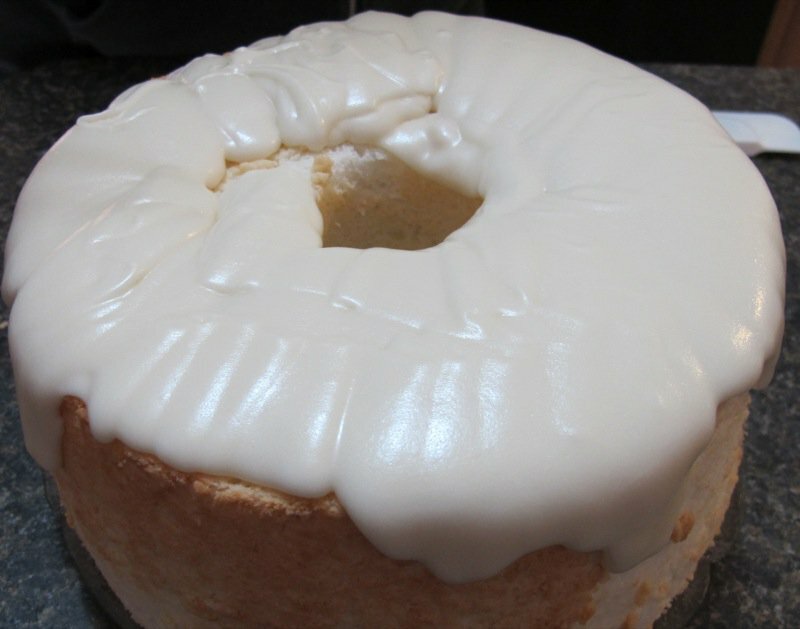 My husband’s grandma made the best angel food cakes, and I could never even come close to duplicating her’s until now. My father-in-law still claims mine aren’t quite as tall, but he says they taste “just like mom’s”. That’s the best compliment ever from him. My husband also raves about this cake. 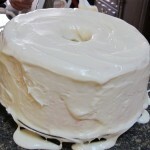 The icing takes it over the top! Mom Helen will be tickled. 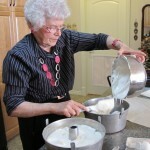 She is baking her 89th birthday cakes as I write. Of course, I made her one, too – but not an Angel Food. 🙂 She’s the best at that one! The icing is brilliant. I have to get a video of her making it! I have already answered you via email. Three times for sifting.